Abraham, Henri.—B. 1868. Professor of Physics in the University of Paris. President of the Societe Francaise de Physique and of the Societe Francaise des Electriciens. General Secretary of the International Union of Physics. Alexanderson, Ernst Frederik Werner. —B. Upsala, Sweden, 1878. Educ. at the University of Lund, at the Royal Institute of Technology, Stockholm, and at Berlin. Entered the service of the C. and O. Electric Company, 1901. Joined the General Electric Company, 1902, later becoming Consulting Engineer to the latter concern. Chief Engineer, Radio Corporation of America, 1920. Fellow and Past President of the Institute of Radio Engineers. Originated and developed the transmitting system used extensively comprising the Alexanderson alternator, magnetic amplifier, and multiple-tuned antenna. Developed the " Barrage " receiver and other kindred inventions. Address : 66, Broad Street, New York. Appleby, Thomas.—B. 1886, near Newcastle on-Tyne, England. Arrived in America, 1888. Went to sea, 1909, as radio operator. September, 1909, in charge of United Wireless Station at Atlantic City, N.J. 1912, in charge of Wanamaker-Marconi Service between New York and Philadelphia Wanamaker Stores. 1917, commissioned in the U.S. Navy as a Lieutenant ( J.G.) for Radio Engineering. Spring of 1918, established shore radio compass stations for the detection and location of enemy vessels in West Atlantic. 1919, Radio Engineer in the Office of the Director of Naval Communications. Resigned from Navy Department and entered profession of Patent Lawyer, (Amer.). 1924, Elected President, Executive Radio Council, Third (U.S.) District. Address : 5847 Ellsworth Street, Philadelphia, Pa., U.S.A.
Appleton. Edward Victor, M.A. (Cantab. ), D.Sc. (Lond.).—B . Bradford, 1892. Educ. St. John's College, Cambridge. First-class Honours in Natural Science Tripos, Parts I and II (Physics). Served European War, 1914-1919, as Captain W/T, R.E. Specially interested in Thermionic - Valves and Atmospherics. Wheatstone Professor of Physics, King's College, London. Late Lecturer at the Cavendish Laboratory, Cambridge. Original papers on Valves and Atmospherics in Philosophical Magazine Radio. Review and Proc. Royal Society. Member of Thermionic Valve and Atmospherics Sub-Committee, Radio Research Board, Department of Scientific and Industrial Research. Fellow of St. John's College, Cambridge. Address : St. John's College, Cambridge, and King's College, London. Arco, Graf Georg von.—B. Grossgorschutz, Schlesien. Educ. at Berlin University and Technical High School, Charlottenburg. 1898, Assistant to the late Professor Slaby in the department of wireless telegraphy. 1915, Doctor, University, Strassbourg. 1915, joined the Allgemeine Elektrizitats Gesellschaft, Berlin. Manager of the Gesellschaft fur Drahtlose Telegraphie, 1903. Carried out practical wireless telephony over a distance of 35 km. 1906. Address : Tempelhof, Berlin, Albrechtstrasse, 49/50. Asano. Dr. Osuke.—B. 1859. Graduated at the Tokyo Imperial University, 1881. Honorary Professor, Tokyo University. Director of The Electrotechnical Laboratory of the Department of Communications, 1897.. Retired 1919. Japanese delegate to the International Conference on Electrical Units and Standards, London, 1908. Responsible for the so-called " Telshinsho " wireless system. Austin, Louis Winslow, Ph.D., D.S.—B. 1867. Educ. Middlebury College, Clark University, and the University of Strasburg. Assistant Professor of Physics at the University of Wisconsin, then joined the staff of the Physikalisch-Technische Reiclasanstalt, Berlin. Specially interested in quantitative high frequency measurements. Head of the U.S. Naval Radiotelegraphic Laboratory, Washington, D.C., since 1908. President I.R.E., 1914 ; Vice-President of the International Union for Scientific Radiotelegraphy. Address : Radio Building, Bureau of Standards, Washington, D.C.
Bardeloni, Colonel C.—B. in Brescia, 1871. Educ. at Milan Polytechnic and Turin Polytechnic. Organiser of the first wireless telephone experiments in the Italian Army and of radio telegraphy for airships (1910). At present Director of the Army Wireless Telegraph Services. Member of the London International Wireless Telegraph Conference, 1912; of the International Time Signals Conference in Paris, 1913, and of the International Radiotechnic Committee in Paris, 1921. Beggerow, Dr. Hans.—B. 1874. Educ. University of Berlin and Freiburg-in-Breisgau. Chief adviser on Wireless Telegraphy to the German Admiralty from 1901 to 1919. Now occupied only with private scientific work. Address: Berlin, W. 15, Meierottostr, 3. Bellini, Dr. Ettore.—B. Foligno, Italy, 1876. Educ. Naples University. Electrical Engineer to the Italian Navy, 1901. Chief of the Naval Electrical Laboratory at Venice, 1906. Carried out extensive research work in connection with Wireless Telegraphy on warships and submarines. Joint inventor with Capt. Tosi, of the radio goniometer. Bethenod, J. F. J.—B. Lyons, 1883. Educ. Central School, Lyons. For a number of years assistant to Professor M. A. Blondel. On taking up his term of military service became associated with General Ferrie, and carried out a number of researches in connection with radiotelegraphy. In 1907 became editor of La Lumiere Electrique. Founded, with M. E. Girardeau, the Societe Francais Radio Electrique, of which he is the Chief Engineer. Has published a large number of papers and articles on theoretical aspects of radio-telegraphy, which gained. in 1921 the Hughes prize of the Academy of Science, Paris. Chevalier of the Legion d'Honour. Member of the Societe Francaise des Electriciens, of the American Institute of Electrical Engineers, and the Institute of Radio Engineers. Address: 15 Rue Michel-Ange, Paris. Binyon, Major Basil, O.B.E., M.A., A.M.I.E.E. —B. Ipswich, 1885. Educ. Leighton Park, Reading ; Trinity College, Cambridge. Natural Science Tripos, 1907, and post graduate course Electrical Engineering. Appointed engineer to Cie. Generale Radiotelegraphique of Paris, 1911. Appointed General Manager Anglo French Wireless Co. Granted commission in R.N.A.S., 1914. Appointed Officer-in-Charge Wireless Experimental Department of R.N.A.S., 1916. Promoted Squadron Commander, 1917. Awarded O.B.E. (military), 1918. Appointed Major R.A.F., M.I.R.E. Managing Director Radio Communication Company, Ltd. Director of C. F. Elwell, Ltd., Mullard Radio Valve Co. Vice-President, Radio Society of Great Britain. Address: 34 Norfolk Street, Strand, W.C.2; "Hawthorndene," Hayes, Kent. Blandy, Col. Lyster Fettiplace, C.B,, D.S.O., R.E.—B. 1874. Educ. Haileybury College and Royal Military Academy, Woolwich. Entered Royal Engineers, 1895: Lieut.-Col., R.E., 1921. From 1908-12 Inspector Royal Engineers Stores at Woolwich. In the beginning of 1913 commanded the Wireless Signal Company at Aldershot. From 1914-17 in charge of Wireless Communication of the B.E.F., France. Became Chief Experimental Officer of Army Signals Experimental Establishment, 1917. Chief Experimental Officer, R.A.F., 1918, and thence transferred Controller of Communications of the Air Ministry ; Head of the British Delegation to the International Technical Committee on Radio-Communication, Paris, 1921 ; Officer of the Legion of Honour ; Chevalier of the Order of the Crown of Belgium ; Mons Star with bar. Address: Naval and Military Club, London. Blondel, Andre E.—B. Chaumont, France, 1863. Graduated at Paris University. Contributor to learned societies and technical journals on several subjects, including wireless telegraphy. Invented (1893) a new apparatus, which is known as the " Oscillograph," and which opened a fresh field for the study of alternating currents. Was the first to explain mathematically (1893), the effect of inertia in the shunting of alternators. Among his other activities in wireless telegraph, mention should be made of directed waves produced by a double aerial oscillating on the fifth harmonic, and also of a system of acoustically syntonic wireless telegraphy. Blondlot, Professor Prosper Rene.—B. Nancy, 1849. After completing his scientific studies in Paris, returned to Nancy. Became Professor at the Faculty of Sciences. Now Hon. Professor and Correspondent of the Institute of France. Devoted considerable study to the problem of electromagnetic waves, the main object of his researches being to determine the speed of propagation of such waves. In 1891 he found for this speed the value 302,200 km. per second, and, in 1893, by another and quite different method, the value 297,200 km. per second. Has also investigated the laws of propagation of wireless waves in various media. Bouthillon, Leon.—B. 1884. Educ. Ecole Polytechnique ; the Ecole Superieure d'Electricite de Paris and the Ecole Superieure des Postes et Telegraplaes. Engineer of Posts and Telegraphs in 1908. In 1911 was nominated Director of Service de T.S.F. de l'Administration des Postes et Telegraphes. Represented France as delegate at the radiotelegraphic conference in London, 1912. In 1920 was nominated Engineer-in-Chief of Posts and Telegraphs. Left the administration of Posts and Telegraphs for private industry. Was General Inspector of Exploitations of La Compagnie Generale de T.S.F. of the affiliated companies and associations. Was Prof. of T.S.F. a l'Ecole Professionnelle Superieure des Postes et Telegraphes. Has been Instructor of Physics at l'Ecole Polytechnique in Paris since 1913. Member of the Societe Francaise de Electriciens ; the Societe Francaise de Physique ; the Societe de amis de la T.S.F. ; Fellow of the Institute of Radio Engineers ; membre du Comite National .Francais de Telegraphies sans fil Scientifique. He has written, in collaboration with G. E. Petit, a work entitled " La Telegraphie sans Fil." He is also the author of an important treatise in 8 volumes entitled " La Theorie et la Pratique des Radiocommunications." Address: 25, Rue Boissonade, Paris. Bradfield, William Walter, C.B.E.—B. London, 1879. Entered the Wireless Telegraph & Signal Co., Ltd., 1897. Electrical assistant to Senatore Marconi all through the course of the latter's experimental work in Radiotelegraphy on Salisbury Plain during 1897. Installed the first wireless apparatus on British battleships, 1899, and later conducted demonstrations to the United States and French Governments. Chief Engineer to the Marconi Wireless Telegraph Co. of America, 1902. Deputy Manager of Marconi's Wireless Telegraph Company, and of the Marconi International Marine Communication Co., Ltd. Manager of both concerns, 1910. Elected to the Board of the two companies, 1917. Joint General Manager Marconi's Wireless Telegraph Company, Ltd., and Marconi International Marine Communication Company, Ltd. Address : 1, St. James's Place, London S.W. Brainard, Raymond.—B. 1888, Dept. of Jura, France. Studied engineering at the Ecole des Arts et Metiers, Cluny, and Ecole Superieure d'Electricite, Paris, 1907. Two years in the electrical industry. Military service at the Eiffel Tower Wireless Station, 1910. Engineer of the Societe Francaise Radio-Electrique, 1911, Visited Belgian Congo as Chief Engineer of Wireless Telegraphy and installed the network of Congoese Station, 1911-12. Installed the station at Laeken, near Brussels. Secretary of the International Commission on Scientific Wireless Telegraphy, 1913-14. During the war attached first to the Wireless Service of the Belgian Army, then to the Wireless Station at Croix d'Hins (Bordeaux), Technical manager of the Societe Independante de T.S.F., 1919. Author of several scientific papers. Chief Engineer of the Societe Belge Radio-Electrique, and Consulting Engineer of the Belgian Congo Wireless Service. Address: 4, Rue d'Egmont, Bruxelles. Branly, Edouard.—B. Amiens, 1844. Educ. St. Quentin College and Henry IV College, Paris. Fellow of the University, Doctor of Physical Science, and Doctor of Medicine. Some of his patents of 1890 and 1891 relate to the electrical conductivity of radio-conductors and to the operation of a local relay circuit from a distance. Officer of the Legion of Honour in recognition of the part he had played in connection with the discovery of "Wireless Telegraphy." Has constructed various independent distributing apparatus for producing tele-mechanical effects without wires. Elected a member of the Academy of Science, Paris, January, 1911. Address: 21, Avenue de Tourville, Paris 7e. Bredow, Hans, Doctor.—B. 1879. Entered the service of the Telefunken Co., as an engineer in 1904, and took over the management jointly with Count Arco in 1908. In 1919 he entered the service of the State, later becoming Secretary of State directing the Telegraph, Telephone and Wireless service of Germany. Brenot, Paul. Born Ruoms Ardeche 1880. Educ. Ecole Polytechnique. Transferred to the Central Establishment of Radiotelegraphy. ..French delegate at the International Conferences of 1912, 1913, 1914, for Wireless, Time, Safety of Life at Sea. Carried through some important experiments on the employment of wireless telegraphy on aircraft 1910-11, which gained him the Cross of the Legion d'Honneur. During the war, whilst remaining in charge of French Colonial Wireless, appointed head of the Radioelectric Centre at Paris and of the Eiffel Tower Station. Left Army 1919. Became Manager of the Societe Francaise Radioelectrique and of the Compagnie Generale de Telegraphie sans Fil. Address: Cie Generale de TSF, 79 Bvd. Haussmann, Paris (8e). Bright, Sir Charles, F.R.S.E., M.Inst. C.E. M.I.E.E., F.Inst. R.E. —Educ. Lancing College and King's College. Engineer and Electrician for the construction, testing, laying and repairing of over 25,000 miles of submarine cable. Consulting Engineer. Gave special expert evidence before Inter-Departmental Cable Communication Committee (1902), House of Commons Radiotelegraphic Committee (1907), and Dominions Royal Commission (1911). Member of R.F.C. (Air) Enquiry Committee (1916). Official delegate at Air Conferences (1920, 1922 and 1923). Contributed papers, addresses and lectures to numerous learned societies, technical journals and reviews. Represented Australia as sole delegate at the International Radio-Telegraphic Conference (1912). Vice-President, Radio Society of Great Britain and Institute of Aeronautical Engineers. Addresses: Hatfield Heath, Essex, 25 Victoria Street, S.W., and Athenaeum Club, Pall Mall, S.W.1. Brillouin, Leon. B. 1889, Docteur-es-Science, Sous-directeur du laboratoire de Physique du College de France. Ingenieur Conseil a la Ste Independante de T.S.F. Address —30 Quai du Louvre, Paris I. Brown, Sidney George, F.R.S., M.I.E.E.—B. 1873, Chicago, U.S.A., of English parents. Educ. Harrogate and London University. Inventor and engineer. Made a special study of submarine telegraphy and is inventor of the magnifying cable relay. Invented the drum cable relay and the magnetic shunt, 1898. In conjunction with the late Sir Henry Hozier discovered the first practical methods of directional Herye waves 1899. Since that date he has also devoted much attention to telephony and wireless telegraphy. Invented microphone amplifier, loud speakers, telephone receivers, Frenophone, etc. for wireless, and the gyroscopic compass for use of board ship. Vice President of the Radio Society of Great Britain. Clubs : Athenaeum, Royal Automobile. Address: 52, Kensington Park Road, W.11. Bucher, Elmer E.—B. Akron, Ohio, 1885. Joined De Forest Wireless Telegraph Company as experimental engineer, 1903. Constructed several high power radio stations in Middle West and on the Gulf Coast. Joined the United Wireless Telegraph Company as construction and experimental engineer, 1904. Installed a number of ship stations for United States Government. Organized the United Wireless Telegraph Company's Instruction School, 1909. Joined the Marconi Wireless Telegraph Company as instructing engineer, 1912. Organized Marconi Institute, 1917, and acted in capacity of director. Transferred to Commercial Department, Radio Corporation of America, 1920, and appointed Commercial Engineer. Held position as Technical Editor of " Wireless Age " during the period 1913 to 1918. Author of " Practical Wireless Telegraphy," " Vacuum Tubes in Wireless Communication," "Wireless Experimenters' Manual" and other works. Appointed Manager of the Sales Department, Radio Corporation of America, 1922. Member of Institute of Radio Engineers. Bullard, Rear-Admiral W. H. G., U.S. Navy. –B. 1866, Pennsylvania, U.S.A. Graduated, U.S. Naval Academy, 1886. Served on ships of the Navy and on shore, with particular reference to the science of Electrical Engineering, in which he had specialised. First Superintendent of the Naval Radio Service, 1912-16 Delegate of the United States at the International Conference for Safety of Life at Sea, London, 1913. During the war his sea service was in the Sixth Battle Squadron of the British Grand Fleet, serving in the North Sea. Member Allied Commission to receive surrender Austro-Hungarian Fleet and to determine status of Fiume. Awarded D.S.M. by U.S. Navy and made Commander of Legion of Honour (France). Given decoration by Poland in recognition of wireless work. After the war he returned to Washington in charge of the Communication Service of the Navy Department, with the title " Director Naval Communications." Author of the "Naval Electrician's Text Book" and other publications. Clubs: Officers Club, U.S. Naval Academy Army and Navy Club, Washington, D.C. , Army and Navy Club of America, etc., etc. Racquet Club, Washington, D.C., New York Yacht Club, etc., etc. Burrows, Arthur Richard,F.J.I. Assistant Controller and Director of Programmes, British Broadcasting Company, B. Oxford, 1882. Educ. City Science and Technical Schools and privately. Migrated from scholastic career (science master) to journalism, and after eight years' provincial editorial training joined editorial staff of The Standard: as news editor of Wireless Press supervised during war (under direction of Naval Intelligence Department) the editing and distribution of enemy wireless propaganda. Organised and directed transocean telephony experiments on C.P.O.S. "Victorian," July, 1920 ; edited the first wireless newspapers (North Atlantic Times) to be produced at sea twice daily. Addressed Second Imperial Press Conference, Parliament House, Ottawa, August, 1920, on "Wireless in Relation to News Gathering"; organised and directed the several international wireless services from Geneva during. the First and Second Assemblies of the League of Nations, November-December, 1920, September, 1921 ; directed earliest broadcast programmes from 2 LO, summer and autumn of 1922. Publications: " The Story of Broadcasting " (1924), and numerous articles for British and foreign magazines and newspapers. Address: 54 Chartfield Avenue, Putney, S.W.15. Club: Reform. Burstyn, Dr. W.—B. Austria, 1877. Educ Vienna University. Started his career as electrical engineer with the Schuckert-Werke, Nurnberg. Later engineer with the Siemens Schuckert-Werke, Charlottenberg; with the Gesellschaft " Telefunken," and others. Wireless engineer with the Russian Navy in the Russo-Japan war, later in Turkey. Developed together with Baron Lepel (1907-12) the quenched spark system. Was Chief Engineer with the A.E.G. until June last. Many publications, especially regarding wireless and electric switching, in "Jahrbuch fur drahtl. Tel.," and other papers. Now proprietor of a Techno Physical Laboratory consulting engineer, and President of the " Association of Radio-, Industry." Address: Berlin – Wilmersdorf Prinzregentenstrasse, 23. Castanon, Lieut.-Col. Don Luis. Spanish Royal Engineers. —B: 1867. 1st Chief of Field Wireless Battalion. One of the pioneers of Wireless Telegraphy in the Spanish Army. From 1904 until 1919 in charge of Wireless affairs at the Centro Electrotecnico y de Comunicaciones de Madrid. Took part in the Mindanao, Luzon (Philippine Islands) and Spanish-American campaigns, and was seriously wounded in action. Chaffee, Professor E. L.—B. 1885, Somerville, Mass. Educ. High School, Somerville, and Massachusetts Institute of Technology in Boston. Graduated B.S. in Electrical Engineering, 1907. Awarded the degree of M.A. in Physics, Harvard University, 1908, and Ph.D., 1911. Conducted courses in physics and radiotelegraphy at Harvard University. Engaged in research and consultation. work in radiotelegraphy, Associate Professor of Physics, Harvard University. Author of several publications. Fellow Academy of Arts and Sciences (Amer. ), Fellow I.R.E. (Amer.), . Member Physical Soc. (Amer. ), Member Optical Sec. (Amer.). Address: Cruft H. T., Elect. Laboratory, Harvard University, Cambridge, Mass. Chamberlain,. Eugene Tyler.—B. Albany, N.Y., 1856. Educ. Albany Academy and Harvard College. Graduated 1878. In business for two years, then took up journalism and acted as legislative and political correspondent to the Associated Press. Appointed Commissioner of Navigation (1893-1921). Prominent advocate of wireless telegraphy as a means of promoting safety of life on merchant vessels at sea, and has since assisted in promoting legislation on this subject. Delegate for the U.S.A. to the Convention on Safety of Life at Sea, at London, 1914. Address: Department of Commerce, Bureau Foreign and Domestic Commerce, Washington, D.C.
Chree, Charles, F.R.S.—B. 1860, Lintrathen, Forfarshire, Sc.D. of Cambridge, Hon. LL.D (Aberdeen). Graduated M.A. Aberdeen, 1879. Ex-President of Physical Society of London and of Royal Meteorological Society. Pres. Section of Terrestrial Magnetism and Electricity, International Union of Geodesy and Geophysics, Obtained Watt Medal of Institution of Civil Engineers, and Hughes Medal of Royal Society. Largely concerned with geophysics, especially terrestrial magnetism and atmospheric electricity. Address: 75 Church Road, Richmond, Surrey. Coursey, Philip R., B.Sc.(Eng.)—B. 1892. Educ. University College, London. Awarded Diploma in Electrical Engineering with Distinction. Graduated with first-class Honours in Electrical Engineering at the University of London. Subsequently acted as Assistant to Dr. J. A. Fleming, F.R.S., at University College, London. From 1915-18 served as Inspector of Wireless Telegraph Apparatus for the Admiralty ; afterwards appointed to the staff of H.M. Signal School, Portsmouth, as Research Physicist. Sometime Research Electrical Engineer to the Dubilier Condenser Co., Ltd,. now Chief Engineer to the Dubilier Condenser Co. (1921), Ltd. Author of many papers on Radio telegraphy and Telephony, read before a number of Societies, and of "Telephony without Wires," and of "The Radio Experimenter's Handbook" (Parts I and II), "The Wireless Telephone—What it is and How it Works," "How to Build Amateur Valve Stations," etc. Associate Member of the Institution of Electrical Engineers, Member of the Royal Institution of Great Britain. Member, Hon. Secretary and Member of Committee of the Radio Society of Great Britain. Address: Stamford House, Marchmont Road, Richmond, Surrey. Craven, Tunis A. M.—B. 1893. Lieutenant, U.S. Navy (Radio Traffic Engineer). Graduated U.S. Naval Academy, Class 1913. Radio Officer, U.S.S. " Delaware," 1913-1915. Fleet Radio Officer, U.S. Asiatic Fleet, 1915-1917. In charge U.S. Naval Coastal and Transoceanic Radio Operations, 1917-1920. U.S. Naval Representative at Provisional Inter-Allied Communication Conference at Paris, France, in 1919. U.S. Naval Radio Technical Advisor at International Conference on Electrical Communications at Washington, 1920. Was also Acting Chairman of Sub-Committee on Wavelength Allocation at this Conference. U.S. Naval Representative at Conference of Technical Committee on International Radio Communication at Paris, France, in 1921. Fleet Radio Officer, United States Fleet, 1922-1923. Radio Division, Bureau of Engineering, U.S. Navy Department, September, 1923. Clubs : Army and Navy, Ends of the Earth, U.S. Naval Institute. Crawley, Lt.-Col. C.G.G. R.M.A.,(ret.) M.I.E.E. —B. 1880. Educ. Dublin University and R.N. College, Greenwich. Employed at Wireless Telegraphy in the Navy, 1903 to 1913, as Experimental, Instructional, and Fleet Wireless Officer. Deputy Inspector of Wireless Telegraphy in the Post Office, 1913. Returned to the Naval Wireless service for the period of the war. Served in the Grand Fleet, in command of the R.N.V.R. Wireless School, at the Admiralty, and supervised the erection sand working of various Naval stations abroad. Officer of Orders. of Aviz and Liakat. Resumed his duties in the Post Office in 1919. Address: General Post Office, London, E.C. De Forest, Dr. Lee.—B. Council Bluffs, Iowa 1873. Graduated Ph.D. 1899. Founded the De Forest Wireless Telegraph Co., 1902, the Radio Telephone Co., and the De Forest Radio Telephone Co., 1907. As the outcome of experiments on high frequency radio currents, he evolved the audion by inserting a grid in the two-electrode valve. M.I.E.E. (Amer. ), Member of the Franklin Institute, M.I.R.E. (Amer.). Address: The Do Forest Radio Telephone and Telegraph Co., Central Avenue, Jersey , City, N.J.
Dellinger, J. H.—B. Cleveland, Ohio, 1886. Educ. East High School, Cleveland, Ohio, graduated 1903 ; Western Reserve University, Cleveland, Ohio ; student 1903-07 ; George Washington University, Washington, D.C.; A.B. 1908. Princeton University ; Fellow, 1912-13. Ph.D., 1913. Chief of Radio Laboratory, Bureau of Standards. Physicist in Bureau of Standards since 1907 to present time. Research on : electrical properties of copper (becoming the basis of international standard) ; miscellaneous mathematical and electrical subjects ; electric units ; science and development of radio communication. Author of three books on radio communication and numerous articles and treatises. Delegate of Department of Commerce at 1921 Conference in Paris of Inter-Allied Technical Committee on Radio Communication. Member of Technical Staff of Conference on Limitation of Armament and Far Eastern Problems, Washington, 1921-1922. Fellow of Institute of Radio Engineers ; Fellow of American Physical Society ; Washington Academy of Sciences ; American Radio League Technical Advisory Committee ; American Geophysical Union ; American Section of the International Union of Scientific Radio Telegraphy. Address : Bureau of Standards, Washington, D.C., U.S.A.
Desbarats, George Joseph, C.M.G., B.Sc. —B. Quebec, Canada, 1861. Educ. various Public Schools ; Ecole Polytechnique, Montreal and Laval University. Engineer on construction of canals and other public works ; assistant to late John Page, Chief Engineer of Canals ; Inspector, Railway Construction ; Acting Deputy Minister of Marine and Fisheries, Ottawa, 1908-09 ; Deputy Minister, 1909-10 ; Plenipotentiary for Canada at the Radiotelegraph Conference held at London, England, 1912. Member of the Engineering Institute of Canada, 1897 ; Councillor, 1907 ; Vice-President, 1909 ; Plenipotentiary for Canada to International Seamen's Conference, Genoa, 1920. Deputy Minister and Comptroller of the Canadian Naval Service June, 1920. Deputy Minister Dept. National Defence, 1924. Address : Ottawa, Canada. De Valbreuze, R.—B. 1877. Engineer-electrician (Ecole Superieure Electricite Paris, 1903). Attached as Officer of Engineers to the Central Establishment of Military Telegraph Materiel. Left Army for industry. During the war was a Captain of Engineers attached to the Radio-telegraphic Centre in Paris. President for 1924 of the Societe des Amis de la T.S.F., M.I.R.E., Member several French Technical Societies. Chevalier of the Legion of Honour. Address: 72, rue Bossiere, Paris (xvie). Dowsett, H. M. —B. London, 1879. Trained as an electrical engineer at Finsbury Technical College. In 1899 joined the engineering staff of the Wireless Telegraph & Signal Co., now known as Marconi's Wireless Telegraph Co., Ltd. Was associated with much of the early developmental work of this company, and after having erected stations ashore and afloat in many parts of the world, was appointed in charge of the test rooms and drawing office at the Hall Street Works, Chelmsford, in 1908. Has held the position of chief of the testing department of the New Street Works from 1912 to the present time. M.I.E.E., F.Inst.P., M.I.R.E. Revised "Handbook of Technical Instructions for Wireless Telegraphists" for the second edition 1915 and third edition 1923, and is the author of "Wireless Telegraphy and Telephony : First Principles, Present Practice and Testing," 1920, and " Wireless Telephony and Broadcasting," 1924. Address: Marconi Works, Chelmsford. Dubilier, William.—B. 1888 in U.S.A.—Educ. Cooper Technical Institute, New York City. President and Technical Director of the Dubilier Condenser and Radio Corporation, New York City. Technical Director of the Dubilier Condenser Co., Ltd., London. Inventor of the Ducon mica condenser ; owner of over 200 radio patents and applications for radio equipment. M.I.R.E. (Amer.). Member of the Radio Club of America and of the Progress Club, New York. Address: Bronxville, New York. Eccles, W. H., D.Sc., A.R.C.S., F.R.S. —B. Barrow-in-Furness, 1875. Entered Royal College of Science, South Kensington, in 1894. Three years later was appointed demonstrator in the Physics Laboratory at the College, and in 1898 graduated at the London University with first-class honours in Physics. In 1899 he entered Mr. Marconi's laboratory at Chelmsford and spent a great part of his time in the investigation of electrical oscillations of air wires and in "jiggers." Devised a laboratory method for testing and classifying coherers, and results of a later study of coherers were presented as one of his D.Sc. theses. In 1901 was appointed Head of the department of mathematics and physics at the South-Western Polytechnic, Chelsea, and afterwards University Reader in Graphics at University College, London. At various times Vice-President of the Institution of Electrical Engineers, of the Physical Society, of the Institute of Physics and of the International Union of Radiotelegraphic Science; First Chairman of the Wireless Section of the Institution of Electrical Engineers ; President of the Radio Society of Great Britain. Since 1916, Professor of Electrical Engineering at Finsbury Technical College ; Member of many Government Committees during the past ten years. Address: 13 Catherine Street, S.W.1. Echevarri, Capt. J. A. V.—B. 1897. Educated King's College School. Gazetted Sub-Lieut. R.N.V.R. January, 1916. Subsequently became Capt. R.A.F. 1918. Appointed Assistant to Head of Wireless Telegraphy Board 1920. British Delegate at International Conference on Electrical Communications, Washington, D.C., 1920, also at International Technical Committee on Radio Communications, Paris, 1921. Appointed Secretary, Wireless Telegraph Board, 1924. Address: Junior Constitutional Club, W.I., and Sand Tiles, Cobham, Surrey. Eckersley, Peter Pendleton, M.I.E.E.—B. La Puebla, Mexico, 1892. Educ. Bedales School and Manchester University. Engineering training at Mather & Platts and Lancashire Dynamo & Motor Co. Joined Royal Flying Corps as Wireless Equipment Officer, 1915, and served in the Middle East, Egypt and Salonica. Officer in Charge Wireless Training, Southern Brigade, 1916. Brigade Wireless Officer in France, 1917. Wireless Experimental Establishment, Biggin Hill, 1917 ; conducted experimental work on duplex telephony for aircraft. Joined Marconi. Co., 1919, Head of Experimental Section, Aircraft Dept. Designed Croydon ground station transmitter. Head of Experimental Section, Designs Dept., 1921. First Regular Broadcasting in England from Writtle 2 MT. Appointed Chief Engineer, British Broadcasting Co., 1923. Address: 140 Goldhurst Terrace, Hampstead. Eichhorn, Gustav, Ph.D.—B. Dusseldorf (Germany), 1867. Took degree of Ph.D. at Zurich University. Entered the wireless telegraph laboratory of Prof. Braun and Siemens and Halske, in Berlin. For 18 months Managing Director of their experimental stations on the Baltic. Publications : Drahtlose Tele graphie (Liepzig, 1904), Wireless Telegraphy (London, 1906), Drahtloser Uberseeverkehr (Zurich, 1921). Returned to Zurich as the representative of the Telefunken Co., 1905, and launched the Jahrbuch der drahtlosen Telegraphic und Telephonie, 1907. Engaged in practical and theoretical work in wireless telegraphy and telephony. Now in the Institut fur Radiotelephonie. Address: Hauptpostfach 6123, Zurich, Switzerland. Elwell, Cyril Frank.—B. 1884. Educ. Fort St. Model Public School, Sydney, Australia ; Stanford University, California (B.A. and E.E. ); Chief Engineer Poulsen Wireless Telegraph and Telephone Company and Wireless Development Co., 1908 ; Federal Telegraph Co. 1909 to 1913, and Universal Radio Syndicate, London, 1913 to 1915. Man. Dir. C. F. Elwell, Ltd., 1915-23. Consulting Radio Engineer. Mem. I.E.E., Mem. Am. I.E.E., Mem. Ital. I.E.E., Fell. I.Rad.E. Clubs : Royal Automobile and Engineers, London. Addresses : 12 Craven House, Kingsway, London, and 20 Great Russell Mansions, 60 Great Russell Street, London. Erskine-Murray, James, D.Sc., F.R.S.E. —B. Edinburgh, October 24th, 1868. After six years' study and research under the late Lord Kelvin at Glasgow University entered Trinity College, Cambridge, as a research student. Assistant Professor of Physics and Electrical Engineering in the Heriot-Watt College, Edinburgh, 1896-98. Appointed experimental assistant to Mr. Marconi, 1898. Lecturer and Demonstrator in Physics and Electrical Engineering at University College, Nottingham, 1900. Lecturer in Electrical Engineering at the George Coates Technical College, Paisley, 1905, Consulting work in radiotelegraphy, 1905. Lecturer on Radiotelegraphy at the Northampton Institute, London, 1907-11. Contributed papers to numerous learned societies and technical journals. Author of several works on wireless telegraphy. Partner in the firm of Clark, Forde, Taylor, and Erskine-Murray, consulting engineers, 1913-18. Served as Lieut.-Commander during the War with the Royal Air Force in charge of the design of wireless instruments and of experimental work till May, 1922. Now Experimental Engineer at H.M. Signal School, R.N. Barracks, Portsmouth. Fellow of the Inst. of Physics ; Fellow of the Institute of Radio Engineers ; Member of the Inst. of Electrical Engineers. Past President of Wireless Society of London. Club, Caledonian. Escolano Llorca, Manuel, Capt. Spanish R.E. B. Valencia, 1891. Educ. at R.E. College, Guadalajara, University College, London, and Marconi School at Chelmsford. As Lieutenant and Captain in the Military Wireless Service (C.E.T. ), has contributed very largely to the development of military wireless. Joined the Marconi Co. in 1913. At present Chief Engineer of the Compania Nacional de Telegrafia sin Hilos Member of Institute of Radio Engineers. Address: Compania Nacional de Telegrafia sin Hilos, Alcala 43, Madrid. Ferrie, General Gustave.—B. at St. Michel de Maurienne (Savoy), 1868. Educ, l'Ecole Polytechnique, Paris. Was present in 1899 during experiments of Senatore Marconi between Wimereaux and Dover. Initiated French Military Radiotelegraphic Service in 1900. Was member of French Delegation to the International Electrical Congress of St. Louis in 1904. Member of the French Delegation to the International Radiotelegraphic Conference of London (1912). Appointed General Secretary of the International Time Conference, Paris (1913). Member of the Inter-Allied Wireless Technical Committee in Washington (1920). President of the Inter-Allied Technical Committee in Paris (1921). President L'Union Radiotelegraphic Scientific Internationale. President of the International Commission on Longitudes. Technical Director of French Military Radiotelegraphy during the war. Member of the Academy of Science (Paris), D.Sc. (Oxford), Commander of the Legion of Honour. Author of the first work on wireless in France, and a large number of contributions on the subject of wireless telegraphy. Address: Commandant Superieur de Troupes et Services de Transmissions, 51 bis, Boulevard de Latour-Maubourg, Paris, 7e. Fessenden, Reginald Aubrey.—B. Canada, 1866. Educ. New York and Port Hope, Ontario. Inspecting engineer to the Edison Company, New York. Took up teaching work and conducted classes in physics and electrical engineering at Western University, 1892. Professor of Electrical Engineering at Western University, Philadelphia, 1893. Special Agent to the U.S. Weather Bureau, 1900. Has devoted much attention to the development of a system of wireless telegraphy known by his name, and has also carried out important experiments in wireless telephony. Field, Rear-Admiral Sir F. L., K.C.E., —B. 1871. Entered Royal Navy, July, 1884 promoted Lieut., 1893 ; qualified as Torpedo Lieut., 1896. Promoted Commander, 1902 ; Captain, 1907 ; Commanded H.M.S. " Duncan,'; 1910 ; Superintendent of Signal Schools, 1912 ; Capt. H.M.S. " Vernon " (Torpedo School), 1914 ; Capt. H.M.S. " King George V " at Battle of Jutland ; mentioned in despatches, awarded C.B. (Military division). Chief of Staff to Admiral Second-in-Command Grand Fleet, 1916. Awarded C.M.G. for this service. Director of Torpedoes and Mining at Admiralty, 1918. Promoted Rear-Admiral, 1919. Third Sea Lord and Controller of the Navy, 1920 1923. K.C.B., 1923. Rear Admiral Commanding Battle Cruiser Squadron, 1923. Member of Committee (appointed November, 1919) to advise British Government on Imperial W/T Communications. Associate Member of Institute of Naval Architects. Addresses: Admiralty, Whitehall, London, S.W.1, and United Services Club, Pall Mall. Fisk, Ernest Thomas.—B. Sunbury-on-Thames, 1886. Joined Marconi Co. in England, 1905, trained and worked in all branches wireless engineering and operating in England, America and other countries. Undertook special mission to Arctic icefields in 1909 and to Australia in 1910,to demonstrate value of wireless equipment, Appointed General Manager Amalgamated Wireless (Australasia), Ltd., in 1913, and Managing Director in 1917. Built up Amalgamated Wireless (Australasia) Ltd. to its present stage of second largest wireless undertaking in British Empire. Successfully established design and manufacture of wireless apparatus in Australia. Conducted important wireless patent actions in Australia 1911 and 1912. Negotiated agreement (1922) under which Amalgamated Wireless (Australasia), Ltd., took over all Government Wireless Services in Australia and Australian Government became largest shareholder in the Company. Received first direct wireless telegraph messages England to Australia, 1928. Gave first public demonstrations in Australia of wireless telephony and broadcasting in 1920. Received first direct transmissions of human voice from England to Australia, 1924. Member Institute of Radio Engineers, Associate Member Institute of Engineers (Australia), Member Royal Society of New South Wales. First President, Institute of Radio Engineers (Australia). Past. President, Wireless Institute of Australia. Past Chairman, Section of Industry, Royal Society of New South Wales. Fleming, John Ambrose, D.Sc., M.A., F.R.S. —B. Lancaster, 1849. Educ. University College School, London ; University College ; R. School of Mines. Sometime Fellow of St. John's College, Cambridge ; Fellow and Hughes Gold Medallist, Royal Society ; Albert Gold Medallist of The Royal Society of Arts, 1921. Lecturer in Mechanics and applied science, Cambridge University (1880). First Professor of Mathematics and Physics (1881), University College, Nottingham. First occupant of Pender Chair of Electrical Engineering, University College, London (1885). Viec-President of Radio Society of Great Britain. Sometime Vice-President of Institution of Electrical Engineers and Phsycial Society. Honorary Member of the Institution of Electrical Engineers. Honorary Member of the Royal Engineers Institute, Chatham. Scientific Adviser to the Edison and Swan United Electric Light Co., 1882-93.. Scientific Adviser to the London Electric Supply Corporation, and many other corporations, firms and companies in electrical matters. Publications: Numerous contributions to scientific literature and research. Author of numerous well-known text-books, particularly on wireless telegraphy. Widely known as the inventor of the Thermionic Valve or Fleming Valve. University Professor of Electrical Engineering, University of London (1912). Address: The Pender Electrical Laboratory, University College, Gower Street, London, W.C.1. Fortescue, Cecil L.—B. 1881. Educ. Oundle School and Christ's College, Cambridge. Engineering training with Messrs. Siemens Dynamo Co., Stafford, 1903-06. Civilian Instructor in Applied Mechanics and Electro-Technics at H.M. Gunnery and Torpedo Schools, Ports mouth, 1906. During the war attached to Wireless Telegraphy Department, H.M.S. " Vernon," and at H.M. Signal School, Portsmouth. Professor of Physics, Royal Naval College, Greenwich, January, 1911, to August, 1922 ; since then Professor of Electrical Engineering, City and Guilds (Engineering) College. M.I.E.E., serving on Committee of Wireless Section of that Institution. Fellow of the Institute of Physics. Member of the Physical Society of London, serving on the Council. Member of Sub-Committees " D " and " D 1 " on Thermionic Valve of Radio Research Board, of the Department of Scientific and Industrial Research. Address: City and Guilds (Engineering) College, Exhibition Road, S.W.7. Franklin, Charles Samuel.—B. 1879. Received engineering and scientific training at Finsbury Technical College. After some time spent in electrical work, first at Manchester and afterwards with the Norwich Electricity Company, joined Marconi's Wireless Telegraph Company (then known as the " Wireless Telegraph and Signal Company "), 1899 and still remains in their service. He has during recent years been engaged in conducting experimental and research work on behalf of Senatore Marconi, and has a number of important patents to his credit. Gainford, Rt. Hon, Lord, P.C. (Joseph Albert Pease). —B. 1860. Educ. Tottenham and Trinity College, Cambridge. Postmaster-General, 1916. Chairman of British Broadcasting Co., Ltd., and Vice-Chairman of Pease & Partners, Ltd. Addresses: 18 Mansfield Street, W.1, and Headlam Hall, Gainford. Girardeau, Emile.—B. 1882. Educ. Ecole Polytechnique. Joined the Army and served as an officer in the Engineers. Managing Director Cie., Generale de Telegraphie Sans Fil, Ci Radio-France, Societe Francaise Radio-Electrique. Director of Radio-Maritime, Ste Anonyme Internationale de T.S.F. (S.A.I.T. ), Ste. Radiotechnique, Ste Radio Romana, etc., etc. Author of various works on a number of subjects relating to wireless telegraphy. Officier de la Legion d'Honneur. Address: 79 Boulevard Haussmann, Paris (8e). Glazebrook, Sir Richard Tetley, Kt., K.C.B., M.A., D.Sc., F.R.S.—B. Liverpool, 1854. Educ. Trinity College, Cambridge. Fifth Wrangler. Studied Physics as Graduate at the Cavendish Laboratory, Cambridge, under Clerk Maxwell and Lord Rayleigh. Fellow of Trinity College, Cambridge (1877). Principal of University College, Liverpool (1898-99). First Director of the National Physical Laboratory (1899-1919). Chairman of the Aeronautical Research Committee. Zaharoff Professor of Aviation and Director of the School of Aeronautics, Imperial College, 1920-23. Past President of the Institute of Electrical Engineers. Medal of the Royal Society of Arts (1918). Member of Technical Committee inquiring into Imperial Wireless scheme. Publications: Numerous works on Physical Optics, Heat, Light, Mechanics and Electricity, as well as numerous papers in Scientific Journals. Hon. Member Inst. C.E. Life Member Inst.Mech.E. Address: Ballards Oak, Limpsfield, Surrey. Goldsmith, Prof. Alfred N., B.Sc., Ph.D. —B. New York City, 1887. Educ. Coll, of the City of New York, 1907 ; Ph.D. Columbia Univ., 191r. Consulting Radio Expert, U.S. Department of Justice, 1912. Consulting Radio Engineer Atlantic Communication Co., 1914. Consulting Engineer General Electrical Co., 1915-17. Director of Research, Marconi Wireless Telegraph Co. of America, 1917-19. Associated Professor in charge of electrical engineering, College of City of New York, since 1924. Chief Broadcast Engineer, Radio Corporation of America since 1924. Editor, "Proceedings of the Institute of Radio Engineers," since 1912. Member U.S. Federal Radio Commission, 1922 and 1923. Made investigations in simplex and duplex radio telegraphy and telephony, transmission of canal rays, precision measurements in radio engineer ing. Author, "Radio Telephony" (Wireless Press), 1918, "Radio Measurements," "Radio Frequency Changers" (Proceedings of the Institute of Radio Engineers), 1915, "World Communication" (Journal of the American Institute of Engineers), 1921. "Radiophone Reception," 1923. Technical Director U.S. Signal Corps School of Communication, 1917-18, U.S. Naval Radio School, 1917-18. Fellow, A.I.E.E., I.R.E., hon. member Radio Club of America, Radio Society of Great Britain, American Physical Society: Club: the Static. Addresses: Van Cortlandt Park South and Saxon Avenue, New York, and 450 West End Avenue, New York, N.Y.
Gordon-Thomsen, Wm.—B.Copenhagen, 1867. Civil Engineer, 1895. Engineer in the Telephone Company of Jutland from 1896, and later Chief of the Technical Department. Chief of the Technical Department in the State Telegraph Board, 1910. Representative of the State Telegraph Board at the office of the Commander-in-Chief for Jutland-Funen, 1903-10. Representative of the Telegraph Directory at the Chief Military Command in Copenhagen, 1911-17. Member of the Radio Telegraph Commission of 1920. Inspector of Wireless Installations from 1923. Knight of Dannebrog. Address: Oster brogade 19, Copenhagen 0, Denmark. Gottwaldt, Commander B.L.—B Christiania, 1880. Entered Naval Academy, Norwegian Navy, 1898. Graduated sub-lieutenant, 1901. Studied electrical engineering, telegraphy, telephony and wireless telegraphy at the Technical College, Charlottenburg. In charge of W/T in the Royal Norwegian Navy, where he was responsible for the erection of naval, land and ship stations, 1909. Appointed Commander, 1912. One of the Norwegian delegates at the International Radio Conference in London, 1912. Late Inspector of W/T, Norwegian Nav. Department. Technical Manager, Norwegian Wireless Company (Norsk Marconikompani). Address: 15, Baldersgate, Oslo. Grattan, Commander Ernest Loftus Colley, R.N. (Ret. ), D.S.O. B.—1881. Educ. Dublin, Stubbington House, Fareham. Lieut. 1905, submarines 1906, Lieut.-Commander 1913. Lent for special service at Gallipoli for wireless telegraphy and signal stations: Dispatches (2), D.S.O. : W.T. stations at Malta, 1916 ; Admiralty in charge shore W.T. and signal stations, 1918 : Act. Commander July, 1918 ; retired 1921 : Assist.-Inspector of W.T., G.P.O., 1921 ; Officer in charge Abu Zahal Radio, 1924. Address: Nutfield, Ascot. Gray, Andrew, A.G.T.T., M.I.E.E., Assoc. M.Inst.C.E. —B. Glasgow. 1873. Educ. Glasgow University ; Royal Technical College. Diploma of latter in electrical engineering. Served as assistant to late Professor Andrew Jamieson, of Royal Technical College. Joined the West India and Panama Telegraph Company, Ltd. (1893). Entered Marconi Company, 1899. Introduced Marconi system to "Hawaiian Islands. Organised telegraph working and training of native operators of Inter-island Telegraph Company of Honolulu. Appointed Chief of Staff to the Marconi Company in 1901 and in that capacity organised the working of the ship and shore wireless service ; designed the original 1½ kw. Ship Set, and supervised the ship and shore operating until 1906, when the engineering and traffic work were separated. Chief Engineer of the Marconi Parent Company 1910, Joint General Manager 1923. Address: 78 Creffield Road, Acton, W.3. Gredsted, M.—B. Copenhagen. 1873. Politic Degree, 1910. Telegraphist in the Government Telegraph Service, 1895. Chief to Ministry of Public Works, Telegraph Department, 1916. Chairman of the Telegraph Examination Board, 1917. Chief of Wireless Instruction, 1923. Inspector of Wireless Installations from 1923. Delegate of International Telegraph Conferences, Paris 1920, and Riga 1921. Knight of Dannebrug. Address: Vesterbrogade 40, Copenhagen 13, Denmark. Guthrie, Frederick Preston. —B. Augusta County, Virginia, 1891. Educ. Chamberlain-Hunt Academy, Port Gibson, Miss. Graduated from Washington Lee University, A.B. Degree, 1911. Vanderbilt Fellow in Astronomy, University of Virginia, 1911-12. Professor of Science, Miami Military Institute, Germantown, Ohio, 1912-13. Assistant Professor of Physics. The Citadel (the Military College of South Carolina) Charleston, S.C., 1913-17. Enlisted in South Carolina Naval Militia, 1915 ; promoted to Lieutenant, 1916) ; called to active duty in U.S. Navy, 1917, remaining on active duty until 1919; served at Charleston Navy Yard and in office. of Director Naval Communications, Navy Department, Washington, D.C. : 1919, assigned to duty with United States Shipping Board Emergency Fleet Corporation by order of Secretary of Navy, to organise Radio Service. Became District Manager for Radio Corporation of America with headquarters in Washington, D.C., 1923. Member of American Delegation to meeting of Technical Committee on Inter-Allied Radio Communication. which met in Paris, 1921. Member of Inter-Department Advisory Committee on Government Radio Broadcasting, 1922 and 1923. M.I.R.E., Member Army and Navy Club, Washington, D.C.. Author. Communication Regulations, U.S. Navy, 1918, Address : 1110 Connecticut Avenue, Washington, D.C.
Hammond, John Hays, Jr. —B. San Francisco, Cal., 1888. Educ. Sheffield Scientific. School (Yale), 1910; Sc.D., George Washington University. Inventor of type of torpedo for coast defence, controlled by wireless energy from coast fortifications. Invented system of automobile torpedo firing type, in latest battleships of U.S.; also aluminothermic incendiary projectiles employed by Allied armies in the Great War : and a radio system of control of ships, employed on U.S.S. "Iowa," for target, practice. Has applied for over 224 patents in U.S. and Europe, relating to radio telegraphy and telephony and wirelessly controlled torpedos. Consulting Engineer the Radio Corporation of America ; and also member of Board of Directors of that company. U.S. delegate Radiotelegraphic Convention, London, 1912. M.I.R.E. America (ex-Treasurer, etc..). Fellow, American Geographical Society, Associate Member American Society M.E. Member Royal Society of Arts, London. Clubs: Eastern Yacht, Yale, Engineers, University. Home: Gloucester, Mass. Harbord. James G. ---Major-General (Ret.) —B. Bloomington, Ill., 1866. Graduated Kansas State Agricultural College, 1886. Served with U.S. Army as 2nd Lieut. 1891. Service in Cuba, Porto Rico and the Philippines, covering some 16 years, during which period he won many distinctions. Appointed Lieut.-Col. 1917, and accompanied Gen. Pershing to France as Chief of Staff, serving in this capacity during the period of organisation of the A. E. F. Commanded the Marine Brigade of the Second Division in the Verdun Sector, and during the fighting in the Bois de Bellean, Bouresches, and near Chateau Thierry. Promoted Major General of the National Army, 1918, and commanded the Second Division at Soissons. Returned to U.S. 1919, and promoted Major General U.S. Army. Deputy Chief of Staff U.S. Army. Elected President Radio Corporation of America January 1st, 1923. Harrison, LieuL-Col. Norman, C.M.G., D.S.O.,M.I.E.E. —B 1873. Educ. in Natal. Served in South African War and European War, 1914-19, as Director of Army Signals in German South West Africa, and as Assistant Director of Army Signals, and Commanding South African Signal Units (attached to Corps of Royal Engineers) in France, 1916-19. Engineer-in-Chief of Posts and Telegraphs, Union of South Africa since 1910 to 1921. Under Secretary 1922 to date. Addresses: (r) G.P.0., Pretoria; (2) Pretoria Club, Pretoria; (3) Civil Service Club, Capetown. Haynes, Frederick Henry. Educ. Hornsey County School. Demonstrator, Science Department, Tottenham Polytechnic, 1911-14. Lieutenant Royal Engineers, served with British Expeditionary Force and in Near East; erection and maintenance of semi-pennanent wireless stations. Later Lieutenant Royal Corps of Signals. Assistant Editor "Wireless World and Radio Review." Author of "The Amateur's Book of Wireless Cireuits," and numerous articles and other publications for the experimenting wireless amateur. Council and General Committee Member of the Radio Society of Great Britain. Hazeltine, Louis Alan. —B. 1887. Educ. Stevens Institute of Technology. In testing dept. of General Electric Co., 1906. Successively Assistant, Instructor, Assistant Professor and Acting Professor in the Electrical Engineering Department, and, since 1918. Professor and Head of that Department of the Stevens Institute. Consulting Engineer and inventor. Assisted, with Albert F. Ganz, Inc., in electrolysis investigation. Member of American Committee on Electrolysis, and Chairman of the Electrolysis Committee of the American Gas Association. Read paper on "Oscillating Audion Circuits" before the Institute of Radio Engineers in 1917. Connected, during the war, with the Radio Laboratory in the Washington Navy Yard. Designed S.E. 1420 receiver, and took a large part in the design of the Neutrodyne Receiver. Was member of three Radio Conferences called by the Secretary of Commerce to consider the control of Radio by that Department. Manager of the Institute of Radio Engineers. and member of American Institute of Electrical Engineers, American Society of Mechanical Engineers, Institute of Radio Engineers, and American Physical Society. Address: Stevens Institute of Technology, Hoboken, N.J.
Hogan, John V. L. —B. Philadelphia, Pa., U.S.A. Educ. Sheffield Scientific School, Yale University. Assistant to Dr. Lee de Forest, 1906-1907. Joined National Electric Signalling Co. at Brant Rock, Mass., 1909. Telegraph Superintendent, Chief of Operating Inspection and Erection. 1911-54. With International Radio Telegraph Co. (successor of National Electric Signalling Co.), as Chief Research Engineer, 1914-17. Commercial Manager, 1917- 18. Manager, 1918-21. Now Consulting Engineer, specialising in radio, acoustics and patent matters. Fellow, Manager and Past-President, Institute of Radio Engineers. Member, American Institute of Electrical Engineers, American Association for Advancement of Science, Radio Club of America, and other technical societies. Author of several books, articles and treatises on wireless telegraphy and telephony. Address: 41 Park Row, New York City, U.S.A. Residence, Forest Hills, Long Island, N.Y.
Holmstroem, J. Gunnar. —B. Stockholm, 1874 Passed through Poly. Acad. Stockholm, 1896. Assistant Royal Swedish Telegraph Dept., 1892. Teacher at Swedish Artillery and Engineers' College, 1904, and College for Naval Officers, 1908 Director of Radiotelegraphic Instruction, Stockholm, Kt.. of "Vasa" Order. Address : Malmskillnadsgatan 19 B, Stockholm. Hooper, Commander Stanford C,, U.S. Navy —B. 1884, Colton, Cal. Educ. at San Bernardino, Calitornia. Started his career as telegraph operator in the Southern Pacific Company. Entered the Naval Academy, Annapolis, Md.. 1901. Graduated 1905. Served as midshipman on the cruiser "Chicago," destroyer "Perry," and monitor "Wyoming." Lieutenant 1910, Lieutenant-Commander 1915, Commander 1918. Instructor of electrical engineering. physics, and chemistry at the U.S. Naval Academy, 1910-11. Fleet Radio Officer of the United States Atlantic Fleet, 1912-13. Early in the war acted as oberver in Europe. In charge of the Radio Division Bureau of Steam Engineering, Navy Department, 1915- 17. Commanded the destroyer "Fairfax" in the Atlantic during 1917-18. then returned to take up duties as Chief of Radio Development in the Bureau of Engineering attached to the U.S. Navy. On duty as Radio Officer U.S. Fleets, on board U.S.S. "Seattle," beginning August 4th. 1923. Address: Navy Dept., Washington, U.S.A.
Howe, Prof. George William Osborn, D.Sc. —B. 1875, Charlton, Kent. Educ. the Roan School, Greenwich, Woolwich Polytechnic, Durham University. Nine years with Siemens Bros., at Woolwich, and Siemens and Halske, at Charlottenburg. Lecturer and later Assistant Professor of Electrical Engineering at the City and Guilds Engineering College, South Kensington. Head of the Department of Electric Standards and Electric Measurements at the National Physical Laboratory. 1921. Appointed in the same year to James Watt Chair of Electrical Engineering in the University of Glasgow. D.Sc. of Durham, Hon. of Adelaide University. Whitworth Scholar. Has read several papers on Radiotelegraphy before the Royal Society, the British Association, the Physical Society, etc. Awarded the silver medal by the Royal Society of Arts (1912) for his paper on "Some recent Developments in Wireless Telegraphy." Member of the Radio Research Board. Address: The University, Glasgow. Isaacs. Godfrey C. —Educ. England, France and Germany. Began life in his father's business and later became manager. Deputy-Chairman and Managing Director of Marconi's Wireless Telegraph Co., Ltd., and Managing Director of the Marconi International Marine Communication Company, Limited till November 1924, when he relinquished these posts on account of health. Address: Lyne Grove, Virginia Water, Surrey. Jackson, Admiral of the Fleet (retired), Sir Henry Bradwardine, G.C.B. K.C.V.O., D.Sc.,LL.D., F.R.S. —B. Barnsley, 1855, Educ. Chester and Stubbington. Entered Royal Navy, 1868. Capt. 1896; Rear Admiral, 1906; Controller of Navy, 1905-08 ; Commanded 6th Cruiser Squadron, 1905-10; Chief of Naval War Staff, 1912-14; First Sea Lord, May, 1915-December, 1916 ; President R.N. College, Greenwich, 1917-19. Hon. Vice-President of Inst. of Naval Architects. Past-President of Radio Society of Great Britain. Chairman of Radio Research Board, M.l.E.E., Hon. D.Sc. Leeds and Oxon and LL.D. (Cantab.). Whilst Commander of H.M.S. "Edinburgh," in 1893, conceived the idea of using Hertzian waves for naval signalling purposes. Continued to take much interest in the development of W. T., and assisted in its organisation in the Navy. Addresses: 17 Catherine Street, London, and The Athenaeum Club. James, William.---Educ. Chiswick Polytechnic. Served in army 1915-1919 in wireless section Royal Engineers. Assistant Editor "Wireless World and Radio Review." Author of "Wireless Valve Transmitters," "Home Constructor's Wireless Guide," etc., and numerous articles. Janet, Paul. -B. 1863, Paris, Studied at the Lycee Louis-le-Grand and the High School. Member of the French Society of Physics, the French Society of Electricians, and the Society of Civil Engineers of France. Professor of Physics at the University of Grenoble, 1886-94. Member de l'lnstitut. Professor of University of Paris, Director of the Central Laboratory and of the High School of Electricity. Author of several important works. Address: Ecole Superieure d'Electricite, 12 and 14, Rue de Stael, Paris (xve). Kajima, Akira. -B. Tokyo, 1883. Graduated from the Greek Catholic Mission High School, Tokyo, 1904, and became Interpreter at the French Embassy from 1905 to 1906. Joined the editorial staff of "Chuo Shimbun" in 1906, and that of the "Kokumin Shinibun" in 1908. Established the Japanese Wireless Press Agency in 1911; Managing Director, the Nippon Radio Telegraphy and Telephony Co., Ltd., 1920. Adviser to the Department of Communications, 1922: proprietor, Xikka Radio Co., 1923. Address: "Musentsusbin-sha," opposite to Hibiya Library, Tokyo. Kellaway, Rt. Hon. Frederick George.-B Bishopston, Bristol, 1870. Educ. Bishopston. Bristol. P.C. 1920. Parliamentary Secretary Ministry of Munitions, 1916. Deputy Minister of Munitions, 1918. Secretary to Department of Overseas Trade, 1920. Postinaster-General, April, 1921. Member of Parliament, Coalition Liberal, Bedford, from December, 1910 to November, 1922. Joined Board of Marconi Wireless Telegraphy Co., November, 1922, During his term of office as P.M.G., was responsible for the institution of Broadcasting and Wireless Telephony. Kennedy, Sir A. B. W., F.R.S. —B. London, 1847. Sometime President of the Institution of Civil Engineers, and the Institution of Mechanical Engineers. Professor of Engineering at University College, London, 1874-89, and founded there the first "Engineering Laboratory." Designed electric lighting and power stations for many companies and corporations, and has also been engaged in railway and constructive work. Knighted 1905 for his services to the Admiralty. Member of the Technical Committee appointed by the Postmaster General to consider the Imperial Wireless Scheme. Associate Member of the Ordnance Committee. Consulting Electrical Engineer to the L.N.W.R.. L.S.W.R., S.E.& C.R., and the London County Council. Chairman of the Electn. of Railways Advisory Committee (Ministry of Transport). Addresses: A,7 The Albany, Piccadilly, and Broadway Court, S.W. Kennelly, A. E.—B. Colaba, Bombay, 1861. Educ. England, Belgium, France and Italy. Past-President of the American Institute of Electrical Engineers, Past-President of the American Association of Illuminating Engineers; President, in 1916, of the Institute of Radio Engineers ; Vice-President of the International Electrical Congresses, Paris and Turin. Left school in 1875 to become a telegraph operator in the Eastern Telegraph Company. Chief electrician on Cable Ship, 1881. Principal electrical assistant to Thomas A. Edison, 1886-92. Consulting Engineer in Philadelphia. In partnership with E. J. Houston, of the Thomson-Houston Company, 1893-1900, Engineer-in-Chief when the cables were laid from Vera Cruz to Campeche, 1902. Professor of Electrical Engineering at Harvard University since 1902 and also at Massachusetts Institute of Technology since 1914. Hon. Sc.D., University, Pittsburgh, Pa., and Toulouse. Prance. Chev. Legion d'Honneur. Hon. Member Inst. Electrical Engineers, London, and of Soc. Francaise des Electriciens, Paris, and a Vice President of the American Academy of Arts and Sciences. Has written twenty-five books as author or collaborator, and more than 150 scientific, papers. Some time Chairman and Secretary of Standards Committee, American Institute of Electrical Engineers, President and Secretary of the American Committee of the International Electro-Technical Commission. Member National Ac. Sciences. A delegate to the Inter-allied Radiotechnical Committee in Paris, 1921. Has specialised in alternating currents. Address Harvard University, Cambridge, Mass., U.S.A.
Kolster, Frederick A.—B. Geneva, Switzerland, 1883. Educ. Public Schools of Cambridge, Mass., and at Harvard University. Assistant to John Stone Stone, 1902-08. Assistant to Lee De Forest, 1909-12, Chief of Radio Section Bureau of Standards, 1912-21, since when Consulting Engineer, Federal Telegraph Co. Attache to American Delegation representing the U.S. at London International Radio Convention, 1912. Inventor of Kolster decremeter, radio compass and position finder, Directional Radio Systems, and other devices. Fellow I.R.E. (Amer. ), Member I.E.E. (Amer. ), Fellow G.S. (Amer.). Address: Cosmos Club, Washington, D.C. ; Engineers Club, San Francisco, Cal. ; or c/o Federal Telegraph Co., Palo Alto, California, U.S.A.
Koomans, Nicolaas. —B. 1879, at Delft. Studied at Delft for mechanical and electro-technical engineer, obtaining his certificate 1901. Entered the Government Telegraph Service. Grad. 1908 at Technical High School at Delft as Doctor in Technical Sciences. Joint-founder and editor of the Monthly Review of Telephony and Telegraphy. joint-founder and member of the managing board of the Dutch Society for Radiotelegraphy (Nederlandsche Vereenig'ng voor Radiotelegrafie). Member of the International Electro-technical Commission. Member of State Patent Office. Professor in Physics and Theoretical Electrical Engineering at the school of the Dutch Post and Telegraph Administration. Supervises the instruction of all the higher officials. Address: Willem de Zwijgerlaan 133, The Hague, Holland. Korn, Professor Arthur.—B. Breslau, Germany, 1870. Studied at Leipsic and Paris. Professor of Physics, University of Munich, 1903-08. Best known as the inventor of a system of telegraphic transmission of photographs, and in 1907 the first photograph was transmitted under this system from Munich to Berlin. Inventor of a system of telautography and wireless photelegraphy. Author of several mathematical works of a mechanical theory of gravitation and electricity. Professor at technical High School, Charlottenburg, Berlin. Address : Charlottenburg, Berlin Schluterstrasse 25. Koto, Major-General, Teizo. —B. Yamaguchi Prefecture, 1873. Entered the military service as cadet in the 6th Engineering Battalion, 1892, and promoted to 1st Lieutenant, 1898. Entered the Technical College of the Tokyo Imperia University as a special student of School of Artillery and Engineering, 1900, and graduated therefrom, 1903. Served in the Russo-Japanese War as the chief of the Field Telegraphy Corps, 1904. Promoted Major and appointed an Inspector of the Military Technical Department, 1905. Appointed Member of the Military Wireless Investigation Committee, 1910. Proceeded to China for the erection of a radio station on Chinwangtao, 1912. Promoted Colonel and Chief of the Communications Department of the Tsingtau Garrison, 1915. Promoted Major-General and Military Engineer, 1919. Connected with the Japan American Radio Telegraph Co. and commissioned by Formosa Government, 1923. Address: 68, Tani-Machi, Ichigaya, Ushigome, Tokyo. Krarup, T. F. —B. Copenhagen, 1868. Lawyer 1891. Head clerk to Criminal judge at Frederiksberg, 1891. Assistant in the Ministry of Home Affairs, 1894. Assistant to Copenhagen Harbour Administration, 1896-1907. Chief of Ministry of Public Works, 1912. Vice-President of the Electricity Commission, 1907 ; Chairman from 1916. Chairman of the Cement Commission, 1917. Member and Secretary of the Telephone Commission of 1917, from 1917; Chairman from 1920. Chairman of the "Gudenaa" Commission and other Commissions concerning water power plants, 1918, and of the Commission regarding Long Distance Radio Telegraph Stations. Knight of Dannebrog. Director-General of Telegraphs and Telephones, 1923. Address: Frederiksberg Alle 55, Copenhagen V, Denmark. Lagorio, E., Capitaine de Vaissean. —B. 1869. Attached to Sous-Secretariat des Postes et des Telegraphes as Director of Service de la T.S.F. (16th June, 1920). Address : Service de la T.S.F., 5, Rue Froidevaux, Paris. Latour, Marius. —B. 1875, in France. Educ. University of Paris and Ecole Superieure d'Electricite, Paris. For many years Consulting Engineer to the General Electric Co., at Schenectady, N.Y. His numerous inventions include improvements in dynamo electrical machinery and several types of A.C. motors bear his name. Invented the high-frequency alternator with reduced number of stator slots known as the S. F. R. alternator, installed at numerous medium and high power stations, including Lyons, Coltano and Ste. Assise. During the war engaged in research work at the laboratories of the Etablissement Central de la Telegraphic Militaire under General Ferrie. His system of elimination of interference produced in telephone lines by neighbouring high-tension power lines has been installed throughout the whole of Northern France. Has specialised in the development of high and low frequency thermionic amplifiers. Fitted the Ste. Assise high power station with his system of balanced multiple earth leads. Consulting Engineer to the Societe Francaise Radio-Electrique, Paris; Ateliers de Constructions Electriques, Jeumont; Compagnie Francaise de Radiophonie, Paris ; and Liaisons Telegraphiques and Telephoniques (L.T.T.) Conflans Ste. Honorine,. Member International Union of Scientific Radiotelegraphy; Chevalier de la Legion d'Honneur. Vice-President of the Societe Francaise des Electriciens. Member of the American Institute of Electrical Engineers. Member of the Institute of Radio Engineers. Head Lecturer at the Ecole Superieure d'Electricite, Paris. Address: 8, Square Desaix. Paris—XV. Listrom, Axel Sigurd. -B. Falun, Dalecarlia, 1881. Entered the Telegraph Service, 1900. Inspector of Wireless Installations, 1913. Chief Engineer at the Radio Division of the Royal Telegraph Administration, Stockholm, 1920. Address: Frejgatan, 58, Stockholm. Ljangqvist, Seth. —B. Falun. Dalecarlia, Sweden, 1880. Passed Mautority Examination, 1899, and Examination of Electro-Technical Branch, Technical University, Stockholm, 1904. Entered the Telegraph Service, 1899. Chief of the Radio Division in the Royal Swedish Telegraph Department, Stockholm, 1916. Address: Vanadisvaegen 23, Stockholm. Lodge, Sir Oliver, D.Sc., F.R.S., Hon. Sc.D. Cantab. :., Hon. D.Sc. (Oxon. !, Hon. LL.D. —B. Penkhull, Staffs 1851, Educ. at Newport (Salop) Grammar School: Entered University College, London, 1873. Graduated D.Sc. 1878. Reader in natural philosophy at Bedford College for Women, and Assistant Professor of Physics in University College, London, for several years, and Professor of Physics at University College. Liverpool, 1881-i900. The First Principal of Birmingham University, 1900. Knighted 1902. Retired 1919. Original investigations on lightning, the seat of the electromotive force in the voltaic cell, the phenomena of electrolysis and the speed of the ion, the motion of the ether near the earth, and electromagnetic waves and wireless telegraphy. His patent (1897) for syntonic wireless telegraphy was extended for seven years by Lord Parker, and was acquired by the Marconi Co in 1911. Has held the position of President of the British Association, President of the Physical Society, and of the Society for Psychical Research. Has made many important contributions to the literature of science, amongst which are "Modern Views of Electricity" (Macmillan), "Electrons" (Bell), "The Ether of Space" (Harper's), "Mechanics" (Chambers), " Atoms and Rays " (Benn). Clubs: Athenaeum, Author's. Address: Normanton, Lake, Salisbury. Loring, Commander F. G., R.N. Inspector of Wireless Telegraphy, General Post Office. Entered the Navy in 1882 (retired 1901). In charge of Admiralty shore wireless stations 1902-08. Admiralty delegate at Berlin International Conference on Wireless Telegraphy, 1906. Appointed Inspector of Wireless Telegraphy, 1908. Post Office delegate at International Conference on Wireless Telegraphy, London, 1912. Technical Adviser to the Board of Trade on Wireless matters at international Conference on Safety of Life at Sea, London, 1914. Address: The Old House, Foot's Cray, Kent. Lyons, Colonel Henry George, D.Se., F.R.S. B. 1864. Educ. Wellington College. Director and Secretary Science Museum since 1920. Director-General of the Survey Department in Egypt, 1898-1909. Victoria Research Medal. R. Geog. Soc., 1911. Symons Gold Medal of Royal Meteorological Society, 1922. Member of the Meteorological Committee. Commandant Army Meteorological Services during the War; Acting Director Meteorological Office, 1918-19. Chairman of SubCommittee "B" on Atmospherics of Radio Research Board of the Department of Scientific and Industrial Research. Chairman National Committee for Geodesy and Geophysics. Address: 3, Cambridge Square. W.2. Makower, A.J. —B 1876. Educ. University College School, Gower Street, and at the College itself, between 1884 and 1895. Studied at Trinity College, Cambridge, taking degree 1898. Proceeded to Technical School. Charlottenhurg, Germany, Joined the British Thomson-Houston Company, Rugby. Received an appointment as Head of the Electrical Engineering Department. At one time Secretary of the Board of Studies in Electrical Engineering, and Chairman of the Board of Examiners in Electrical Engineering. Author of many papers on wireless subjects. Resigned his teaching post and became managing director of Mossay & Co., Ltd., designers and selling agents for commercial electric vehicles, 1918. Chairman of the Electric Vehicle Committee of the Society of Motor Manufacturers and Traders. Addresses: 12, Greencroft Gardens, N.W.6, National Liberal Club, and The Oxford and Cambridge Musical Club, and 7, Prince's Street, S.W. Marchant, Edgar Walford, D.Sc.—B. 1876. Educ. University School, Hastings, and Central Technical College. Graduated B.Sc. at London University with honours in physics and mathematics, and subsequently took the degree of D.Sc. After serving an apprenticeship appointed Superintendent of Lord Blythsthswood's laboratory and workshops at Renfrew, N.B., 1897, where he carried out many experiments in wireless telegraphy. Leaving Renfrew in 1900, served as chief assistant for one year at the Finsbury Technical College under the late Professor Silvanus P. Thompson. Lecturer in electro-technics. at University College, Liverpool, 1901, and later Professor of Electrical Engineering. Closely associated with the late Mr. Duddell in the development of the oscillograph. Author of a number of articles on wireless and cognate subjects, including a short book on "Radio telegraphy and Telephony." David Jardine Professor of Electrical Engineering in the University of Liverpool. Vice-President of the Radio Society of Great Britain. Past President of the Liverpool Engineering Society, Past Chairman of the Manchester Section of the Institution of Electrical Engineers. Address: 2 Ivanhoe Road, Sefton Road. Liverpool. University Club, Liverpool ; Royal Liverpool Club. Marchant, W. H. —B. London, 1881. Commenced experimental work in connection with W/T. 1904. From 1906-11 he served with De Forest Syndicate, Poulsen Company, and Lepel and Anglo-German W/T Companies, being chiefly engaged in experimental work. Since 1911 he has devoted himself mainly to literary work and to teaching. At present in the service of the Eastern Telegraph Co., at their London training centre. Address: 4 Branch Hill Side, Hampstead, N.W.3. Marconi, Senatore Guglielmo, G.C.V.O., LL.D., D.Sc.—B. Bologna, Italy. 1874. Irish on his mother's side. Educ. Leghorn and Bologna. First interested himself in the problem of wireless telegraphy, 1895. Visited England 1896, and took out the first patent ever granted for a practical system of wireless telegraphy by the use of electric waves. Earliest experiments in England made at Westbourne Park. The Italian Government conferred upon him the honour of knighthood. He has been decorated by the King of Italy and the late Czar of Russia, is an honorary doctor of many universities, besides having received the freedom of the principal Italian cities. In 1909 (in conjunction with Professor Braun) he was awarded the Nobel Prize for Physics. In 1912 he was decorated with the Grand Cross of Alfonso XII and made Grand Officer of the Order of St. Maurice and Lazarus. Elected a senator in the Italian Parliament (1914). On July 24th, 1914. the King bestowed upon him the Honorary Knighthood of the Grand Cross of the Victorian Order. He also holds many scientific awards granted by various societies and institutions, including the Albert Medal of the Royal Society of Arts, of which he is Vice-President. April 12th, 1915, Awarded the Gold Medal of I.R.E. (America) College of the City of New York, June 10th, 1922, and John Fritz Gold Medal for the Invention of Wireless Telegraphy, July 6th, 1922. Immediately on the declaration of war by Italy, he was given the rank of Lieutenant in the Italian Army. He has been employed on important military missions to England by the Italian Government, and on July 29th, 1916 was promoted Captain "for exceptional services." At the beginning of September, 1916, he was transferred from the Italian Engineering Service to be Commander in the Navy. He visited the United States, 1917, as Member of the Official Mission sent by Italy to the U.S.A. Government. On June 26th, 1919, he was appointed by H.M. the King of Italy Plenipotentiary Delegate to the Peace Conference a& Paris, and in this capacity he signed the Peace Treaties with Austria and Bulgaria. At the end of 1919, he was awarded the Italian Military Cross. He has been decorated with the Italian "Ordine Civile" of Savoy, and has been nominated by the King of Italy to be a member of the Supreme Council of the same Order, He is Chairman of the Board of Directors of the Marconi Company. Address: Marconi House, Strand, W.C.2. Marriott, Robert Henry. —B. 1879. First experimented with wireless telegraphy in 1899, while student at the Ohio State University, U.S.A. Employed by the American Wireless Telephone and Telegraph Company, Philadelphia, 1901, for which company he erected stations at Breille, Galilee and Barnegat, N.J. Chief Engineer of the Pacific and Continental Wireless Telephone and Telegraph Company. Installed three stations in California, at Avalon, Santa Catalina Island and San Pedro, 1902. Employed with the Carstarphen Electric Company at Denver, Colorado, 1903. Constructed stations for the American De Forest Wireless Telegraph Company, and its successor, the United Wireless Telegraph Company, in Colorado, Wyoming, and Texas, 1905. In charge of this Company's construction and maintenance, 1910. Entered Marconi Wireless Telegraph Company of America, 1911. Entered the U.S. Government service as Radio Inspector, 1912. Now Radio Engineer, Puget Sound Navy Yard, Washington. First President of the Institute of Engineers. McLachlan, Norman W., D.Sc. (Eng.) —B Longtown, Cumberland, 1888. Educ. Carlisle Grammar School and the George Watson and the Heriot-Watt Colleges, Edinburgh, and Liverpool University. Served apprenticeship with Messrs. Bruce, Peebles & Co. In 1909 was appointed Lecturer in Engineering and Mathematics at Newcastle-on-Tyne. In 1914 Supervisor of Classes in Engineering Subjects in the Liverpool Technical Institutes. During the war carried out much research work for Government in aeronautics and anti-submarine devices, organising a laboratory at Air Ministry for research on liquid and gaseous oxygen apparatus for aircraft use. After the Armistice engaged in magneto research at the National Physical Laboratory, Teddington. At present Independent Research Engineer in service of Marconi Company. Associate of the Heriot Watt College and a D.Sc. (Engineering) of the University of London. M.I.E.E., Fellow P.S. Lond. Fellow Inst. P. Author of many papers on various subjects in the Journal of the Institution of Electrical Engineers and other scientific journals. Holds patents for Wireless Telegraphy and allied subjects. Inventor of Magnetic Drum Recorder for relaying and recording wireless signals at high speeds. Addresses: Marconi Works. Chelmsford, and Engineers' Club. McPherson, Andrew. —B. 1880. Educ. at Allen Glen's School and the Royal Technical College, Glasgow. Engineering Training with the Electric Construction Co., Ltd., of Wolverhampton. Was appointed Assistant Engineer to the Public Works Department of the Nigerian Government, Chief Engineer of the Nova Ernpreza Luz Electrica, Maceio, Brazil, and later Engineer and Manager of the Madeira Electric Lighting and Power (1909) Co., Ltd., Funchal, Madeira. Joined the G.P.O. in connection with the original scheme for the Imperial Wireless Chain. and in 1915 was transferred to the Admiralty in connection with Wireless Telegraphy Engineering. From 1915 to 1917 was eagaged in inspecting and reporting on Wireless Telegraphy Stations abroad. At present head of the Wireless Shore Station Division of H.M. Signal School, Portsmouth. Address: 22, Cousin's Grove, Southsea, Hants. Meissner Alexander, Dr. Tech. Dr. Eng. —B. Vienna, 1883. Studied at Technical High School and University, Vienna; became assistant at the Technical High School. Joined the Laboratory of the Telefunken Company, Berlin; prominent part there in the development of the technique of wireless in Germany, having been responsible for the introduction of the Flat-coil, musical quenched sparks, timed sparks, Telefuuken compass, interference-reception, direct current cathode valve relay for Morse reception, valve generator, etc. Address: Berlin W. Mathaikirchstr 11. Mesny, Rene. —B. 1874. Educ. The Naval School, Brest. Naval Officer 1894, Professor of Naval Construction in the Naval School, 1901. During the war attached to the wireless service. Now attached to the Laboratoire de la Radio-telegraphic Militaire. Officer of the Legion of Honour, Member of the Societe de Physique and the Societe des Electriciens. Secretary of the Societe des Amis de la T.S.F. Address: Direction du Material de la Radio-telegraphie Militaire, 51 bis, Bd. Latour Manhourg, Paris. Mezoviris, Greg, Commander, R.N. —Born 1891. Educ. Royal Naval College, 1906-1910. Offioer of the R.N., 1910: Served during the Balkan War (1912) on different ships, 1913-1915 in submarine service. Specialised as torpedo officer and served on the battleship "Averoff." Appointed to the Naval War Staff (1917). During the European war served on destroyers. In 1919 appointed to the Torpedo School as professor of electricity. Promoted commander in 1920. Sent by the Greek Government to Paris, followed a special course on wireless telegraphy at the "Ecole Superieure d'Electricite," during the period 1920-1921, and obtained the diploma of radio-engineer. On his return to Greece was appointed chief of the technical department and first assistant to the Head of the Radiotelegraphic service of the Navy. Chief of the main Athens station and Professor at the Radiotelegraphic School. Since 1922 he has also been professor of Electricity at the Military Academy and the Royal Naval College. Author of six books on eleetricity and wireless and contributor of many articles to the "Naval Review." In the end of 1923 he was appointed Head of the Radiotelegraph Service of the Navy. Address: 24 Ithakis Street, Athens. Mullard, S. R., M.B.E. —B. 1883. Educ. Private and London Electrical Engineering Colleges. Apprenticed to London firm of electrical engineers; 1908, Assistant Works Manager Societe Anonyme de Usines Piutsch. 1910 to 1915. Head of Research Laboratory, Edison & Swan, Ltd. (here developed the "Pointolite" arc lamp). 1916 to 1918, Lieut. R.N.V.R. ; attached to R.N.A.S. for wireless duties. 1918 to 1919, Capt. R.A.F.. Head of Wireless Section Research Laboratory, Imperial College of Science, on behalf of Air Ministry. 1919 to 1920, Research in wireless valve manufacture and development. Contractor to H.M. Government for wireless valves. September, 1920, formed the Mullard Radio Valve Co., Ltd. Appointed Managing Director of the Company. Club: Royal Air Force. Address: 45, Nightingale Lane, S.W.12. Nally, Edward Julian. —B. Philadelphia, 1859. Pioneer in different modes of communication in America in telegraph, telephone and wireless. Started as a messenger boy for Western Union Telegraph Co., St. Louis, worked his way up through various steps to the position of first Vice-President and General Manager of the Postal Telegraph Cable Company. which he resigned in 1913 to accept the office of Vice President and General Manager of the Marconi Wireless Telegraph Company of America. Under his management the first commercial wireless circuit was opened to the public between the United States and Japan in 1914. During the period of the war commercial wireless service by private companies was interrupted, but immediately upon the return of the stations by the United States Government on March 1st, 1920, he established the first direct commercial wireless circuit between the United States and Great Britain, which was soon followed by similar services to Norway, Germany and France. Upon the formation of the Radio Corporation of America, in 1919, he was elected President and Director, which position he resigned in 1922 to become Managing Director of International Relations (R.C.A.). 1923 elected Managing Director Commercial Radio International, Committee. Clubs: Century, Interallie (Paris), Lawyers, Caxton, Static, Bookfellows. Societies: Pennsylvania. China, American Geographical, National Geographical, Ends of Earth, American Irish Historical, Friendly Sons of St. Patrick Residence: El-Ar-En Farm, New Hamburg, N.Y. Business address: Woolworth Building, New York City; 20 Rue de la Paix, Paris. Navarro y Ortiz, D. Benito, Major, Spanish Royal Engineers.- Chief of the Wireless Service of the Army permanent land stations (1918). In 1913 took charge of the Spanish Army Station of Carabanichel EGC (Madrid), until 1918. Decorated by the Spanish Government with the White Military Cross (December, 1919) for hit knowledge and merit in wireless matters. Has contributed largely to the development of wireless telegraphy in Spain. Noble, Sir William. —B. 1861. Educ. Public Schools and Gordon's College, Aberdeen. Commenced his career in Aberdeen Telegraph Office as a telegraphist. In 1893, Engineer for the north-east area of Scotland. In 1897 promoted to Headquarters, London, as First-class Engineer. Subsequently successively Technical Officer, Assistant Superintending Engineer, London, Staff Engineer at Headquarters, Superintending Engineer, London, and in 1912 Assistant-Engineer-in-Chief, succeeding to the premier position in June, 1919. Retired January, 1922. Now Director of General Electric Co. and of British Broadcasting Co. In 1919 the King of the Belgians made him a "Chevalier de 1'Ordre de la Couronne." Knighted June, 1920. Contributed articles to "Encyclopedia Britannica" on Telegraphy and Telephony, and paper to I.E.E., M.I.E.E, Inst. P.O.E.E. Addresses: Royal Automobile Club, and National Liberal Club, The Chase, Black down, Leamington Spa, and Magnet House, Kingsway, W.C.2. Norman, Major the Rt. Hon. Sir Henry, B.A., 1st Bt. cr. 1915, Kt. cr. 1906. M.P. Blackburn 1910-23. J.P. B. Leicester, 1858. Educ. privately in France; Harvard University (B.A. ); Leipsig University; Officer of Legion of Honour; Mons Star, 1914. Assistant Post master-General, 1910; Chairman War Office Committee on W/T (1912); Member of Committee on National Telegraphic Research and P.O. Telegraph Organisation Committee; Member of British Association Committee of Radiotelegraphic Investigation and of International Committee of Radiotelegraphic Research ; Chairman of Imperial Wireless Telegraphy Committee (reported May, 1920); Vice-President of Radio Society of Great Britain; Fellow of Physical Society; Fellow of American Institute of Radio Engineers; Liaison Officer with French Government for Military inventions; Vice-Chairman Imperial Communications Committee from March. 1919, to November, 1922, and Chairman of Wireless Sub-Committee. Member Broadcasting Committee, 1923. Addresses: The Corner House, Cowley Street, S.W 1; Ramster. Chiddingfold, Surrey. Clubs: Reform, Royal Automobile, Ranelagh. Pannill, Charles Jackson. —B. Petersburg. Va., 1879. Entered U.S. Navy 1898, Chief Telegraphist of United States Coast Signal Service. Entered service of Professor Reginald A. Fessenden, 1902. Conducted experiments in radio communication across Hampton Roads. Installed communication by radio between New York and Philadelphia, 1903. Installed first radio outfit on United States battleship. Conducted experiments between stations of General Electric Company at Lynn and Schenectady also between Brant Rock, Mass., and Machrihanish Bay, Scotland. Entered service of Marconi Wireless Telegraph Company of America, 1912. Superintendent, Southern Division. Entered service of United States Government, 1914 as expert radio aid, Naval Radio Service, shortly after outbreak of world war. Promoted to Assistant to Director Naval Communications in charge of commercial radio service, 1917. Now Vice-President and General Manager Independent Wireless Telegraph Company, New York. Fellow Institute of Radio Engineers. Member Washington Society of Engineers. Member of the Geographical Society. Member Westchester Biltmore Country Club. Pedersen, P. O. —B. at Sig, near Varde, Jutland, 1874. Entered. Royal Technical College, Copenhagen (1892). Cand. Polytechnic (1897). Chief Engineer of Telegrafonen, Ltd. (Poulsen Patent), 1899-1902. Lecturer at the Royal Technical College, Copenhagen, and Professor from 1912. On board of Dansk Telegrafonfabrik (Danish Telegraphone Co., Ltd.), 1903-12, as well as on Elektroteknisk Forening (Electrotechnic Association) from 1910 ; Chairman from 1916. President Danish Institute of Civil Engineers 1920-23. Director of Det Kontinentale Syndikat for Poulsen Radiotelegrafi (Continental Syndicate for Poulsen Radiotelegraphy) from 1911-19. Member of International Electrotechnical Commission, Fellow Inst. Radio Engineers since 1915. Fellow Am, Inst. Electrical Engineers since 1920, Member of the Institution of Electrical Engineers 1924, Member of Academy of Engineering Sciences, Stockholm, 1924, and a Fellow Royal Danish Academy of Science since 1917. Member of the Telephone Commission (1917), of the Control Committee of licensed Telephone Companies, of the Commission on the training of radio operators, and of the Radio Commission of 1920. Technical Adviser in Radio to the Department of Public Works 1922. Principal of and Professor in the Royal Technical College, Copenhagen. His contributions to electrotechnical literature have been both important and numerous. Address: Amalievej 1, Copenhagen, V. Denmark. Perl, Francois Michel. —B. 1871. Educ. Lycee National, Toulon. Commandant of Colonial Infantry. Officer of the Legion of Honour. Planned the wireless chain in Indo-China, comprising 15 stations and 2 D.F. installations. During the war he supervised the construction of the high-power station at Doua, which on and after September 21st, 1914, secured communication with Russia and, later, with America. Introduced the first C.W. apparatus for aircraft, employing vacuum tubes of his own invention. Specialist in vacuum tubes. Inventor of the intertwined type of grid and anode, the zig-zag calibrated grids of great rigidity (patent acquired by the Cie Generale de T.S.F. ), Co-inventor of the French valve (Peri-Biquet Patent, acquired by the Marconi Company). Inventor of the resistance coupling for amplification (patent acquired by the Soc. Francaise Radioelectrique), of the electrostatic microphone condenser, and of various appliances for the protection of receiving apparatus from atmospheric disturbances. Constructed and inaugurated in March, 1923, the large station at Yunnanfon (China). equipped with high-frequency alternators. Consulting Engineer to the Societe Radiotechnique. Address: 65, Avenue de Neuilly, Neuilly-sur-Seine. Petavel, Sir Joseph Ernest, K.B.E., D.Sc., F.R.S. —B. 1873. Educ University College, London. Scientific Research at the Royal Institution and at the Davy Faraday Laboratory, 1896-98. John Harling Fellow, Owens College, Manchester, 1900-03. Scientific Manager, Low Temperature Exhibit of the British Royal Commission for the St. Louis Exhibition. 1904. Professor of Engineering and Director of the Whitworth Engineering Laboratories, University of Manchester, 1908-19. At present Director National Physical Laboratory, Teddington. Publications: Papers in the Philosophical Transactions of the Royal Society, "The Philosophical Magazine," "Engineering," etc. Member of Aeronautical Research Committee and other Government Committees connected with Aviation. Member of Committee on Imperial Wireless Scheme, Clubs : Athenaeum; Royal Automobile, Primrose Club, London. Address: National Physical Laboratory, Teddington, Middlesex. Pickard, Greenleaf Whittier. —B. Portland, Me., 1877. Educ. Westbrook Seminary, Harvard, and Mass. Institute of Technology. Began radio work 1899, at Blue Hill Observatory, Milton, Mass., under a grant from the Smithsonian Institution. Became associated with Harry Shoemaker, 1901. On the engineering staff of the American Telephone and Telegraph Company, 1902-06. Developed a practical system of radiotelephony, obtaining successful speech transmission without wires, 1902. From 1906 until the present date has been connected with the Wireless Specialty Apparatus Company as consulting engineer. Inventor of a method of reducing static interference, which was extensively used by the U.S. Navy for transatlantic reception during the war. Practices extensively as patent expert in wireless patent litigation, and is the author of many papers on radio communication. Fellow of the American Institute of Electrical Engineers. Member of the American Electrochemical Society. Member of the Society of Mechanical Engineers. Past President and Fellow of the Institute of Radio Engineers. Private address: Newton Centre, Mass. Office address: 76, Atherton Street, Jamaica Plain, Mass. Pocock, Hugh S. — Editor " The Year Book of Wireless Telegraphy and Telephony " prior to outbreak of war. Captain Royal Engineers. serving Egypt, Mesopotamia, Persia, on intelligence duties. Mentioned in dispatches for wireless services in Mesopotamia. Editor "The Wireless World and Radio Review." Member of the Institute of Radio Engineers, and Committee Member of the Radio Society of Great Britain. Address: 20, Brondesbury Villas, N.W.6. Pomey. Jean-Baptiste. —B. Paris, 1861. Educ. Ecole Polytechnique. Entered the service of the Administration of Posts and Telegraphs in 1881 and became in time Inspector-General. Assistant Professor of Mechanics at the Ecole Polytechnique, Laurcat de l'Institut, Professor of Theoretical Electricity at the Ecole Superieure des Postes and Telegraphs, Director of this School and of the Service for study and technical rescareh. During the war was Chief of the Telegraph Service, first at Coul and later with the Eastern Army. Was appointed Assistant to the Director of Military Radiotelegraphy with the rank of Lieutenant-Colonel, Officer of the Legion of Honour. Poulsen, Valuemar, Eng., D.Sc. D.Ph., Leipzig (1909). —B. Copenhagen, 1869. Studied at University of Copenhagen, 1889-93. Entered technical department Copenhagen Telephone Company, 1893, and for a number of years superintended electrical testing operations. Collaborated with Prof. P. 0. Pedersen for many years. Member of the board of the Telegrafonen, Ltd. (Poulsen Patent), 1902-16. Joined board of Dansk Telegrafonfabrik, Ltd., 1909, and that of Poulsen Wireless Telephone and Telegraph Company, U.S.A. (1909-11). Fellow of Danish Society of Sciences (1914). Grand Prix at Paris in 1900 for telephone work. Invented in 1903 the arc method of generating continuous electrical waves of wireless frequencies. Address: Gentofte Maltegaardsvej 6, Copenhagen. Rego, Capt., T. R. Moraes. —B. Rio de Janeiro, 1882. Completed training at Naval Academy, 1900. Served for a few years on ships, studying electricity and torpedoes. Torpedo-Lieutenant in the Professional Torpedo School. Began studying radiotelegraphy when first wireless stations were installed in Brazilian Navy, 1904. Assistant in the Radio Department of the Navy on several occasions. Appointed (1914) Chief of the Radio Service, Brazilian Navy, which post he resigned to be appointed Commander of warship "Alagoas" in 1920, resigning this command in 1922, and being then appointed Sub-Chief Military Staff of President of the Republic of Brazil. Club: Naval Club. Address: Palacio Presidencial, Cattete, Rio de Janeiro, and Rua Ipanema 22, Copacabana, Rio de Janeiro. Reith, John Charles Walsharn, M.Sc., A.M.I.C.E., A.M.I.Mech.E. —B 1889. in Scotland. Educ. the Glasgow Academy, Gresham's School, Norfolk'. and the Royal Technical College, Glasgow. Engineering apprenticeship in Glasgow. 1912-14 Engineer with S. Pearson & Son, Ltd., London. Service in France, Oct., 1914—Nov., 1915, with Royal Engineers (Major). Wounded. In charge of American munitions contracts in America 1916-17; engaged on special construction work in England, latterly with the Admiralty, 1918-19; after Armistice in charge of liquidation of armament and engineering contracts, 1919-20. General Manager of William Beardmore & Co., Ltd., Coathridge, 1920-22, Managing Director of the [BBC|British Broadcasting Company, Ltd.]], 1922. Clubs: Caledonian and Cavendish, London; Western, Glasgow. Reoch, Alexander.—B. Sheffield, England, 1884. Educ. Sheffield Science School and Sheffield University College. Graduated in electrical engineering, 1902. Entered the service of the English Marconi Company in June, 1902, and undertook construction and operating work in England, Holland, Germany, and Egypt. Appointed engineer with the, Canadian Marconi Company, 1905, and from 1909 to 1911 in complete charge of the business during which time that company's contract with the Canadian Government for the operation of the Great Lakes stations was negotiated, as well as the contract between the Canadian Company and the Newfoundland Government. Chief Engineer of the Canadian Marconi Company, 1917, and at the beginning of 1918 he relinquished this position to take an appointment on the engineering staff of the American Marconi Company. Appointed, 1920, Plant Engineer. Radio Corporation of America. Appointed January 1st, 1921, Assistant Chief Engineer Radio Corporation of America. Fellow Institute Radio Engineers. Associate Member Engineering Institute of Canada. Member Franklin Institute of the State of Pennsylvania. Address: 66, Broad Street, New York. Rivers-Moore, H.R., B.Sc., A.C.G.I., A.M.I.E.E., F.R.S.A. —B. 1884. Educ. at Wellington College and London University. Apprenticeship George Clark, Ltd., Engineers, Sunderland. Post Office Engineer-in-Chief's Dept., 1907. Delegate to 2nd International Telegraph Conference at Paris, 1910. Appointed to Wireless Section of the Post Office, December, 1910. In 1913 purchased and carried on the business of the Wilson Apparatus Co. In 1916 this business was taken over by the Indo-European Telegraph Co., Ltd., and associated successively with Messrs. Creed & Co., Ltd., Croydon, and Automatic Telephone Co , Liverpool. Appointed in 1918 Asst Physicist at Admiralty Anti Submar:ne Dept. Parkstone Quay, and subsequently given the rank of Hon. Capt. Marines. In 1919 organised the firm of "R. M. Radio, Ltd.," and is Chairman of this Company and of General Wireless, Ltd.
Robinson, James, M.Sc., Ph.D. —B. 1884. Educ. University of Durham and University of Gottingen. Lecturer in Physics, University of Durham, 1906-7. Lecturer in Mathematics, Armstrong College, 1909-10. Lecturer and Demonstrator in Physics, University of Sheffield, 1910-12. Lecturer 1n Physics, East London College, University of London, 1912-15. Examiner in Physics, University of London, 1912-15. Lieut. R.N.V.R. for Wireless Duties, 1915-17. R.N.V.R., attached R.N.A.S. for Experimental Wireless Duties, 1917-18. Captain R.N.A.S. for similar duties, 1918-20. Chief Experimental Officer, Instrument Design Establishment, Biggin Hill, 1920-22. Head of Department for Wireless and Photography. Royal Aircraft Establishment, Farnborough, 1922. Responsible for various Patents. F.Inst.P. Fellow Physical Society of London. Member Radio Society of Great Britain. Address: R.A.F. Club, 128, Piccadilly, W.1, or Royal Aircraft Establishment, South Farnborough, Hants. Rodrigues, Apolinio Gomes da Silva. Flag Captain in the Portuguese Navy. —B. 1866. Entered Portuguese Navy in 1886. Became Professor of Electricity and Torpedoes at the Naval College in 1902, and Professor of Electricity of Naval Auxiliary College, 1905. Entrusted with embodiment of Naval Regulations concerning wireless in 1909. Elected Member of Advisory Committee on wireless in the Portuguese Navy in 1910. Rutherford, Sir Ernest, Kt., F.R.S. —B. New Zealand, 1871. Educ. Nelson College, Canterbury College, New Zealand University, Cambridge University. Cavendish Professor of Experimental Physics, Cambridge, and Fellow of Trinity College, 1898-1907, Professor of Physics, McGill University, Montreal, 1907-1919, Professor of Physics, University of Manchester. Nobel Laureate, 1908. Has published many works dealing with the conduction of electricity through gases and radio activity. Address: Newnham Cottage, Cambridge. Rydin, Sven Ludvig Herman. —B. Upsala, 1861. Graduated in Law, Upsala, 1885. Registrar attached to the Board of the State Railways, 1895-96, assistant to Director of the State Railways 1896-97, Member of the Board of Telegraphs 1897-1902, Under-Secretary of State for Home Affairs 1902. Since 1905 Director-General of Telegraphs in Sweden. Grand Commander of the "Nordstjaerna." Member of "Idun," Society in Stockholm for Science, Literature and Art, and of the Royal Swedish Yacht Club (Kungl. Svenska Segel Sallskapet, K.S.S.S.). Address: Kungl Telegrafstyrelsen, Stockholm. Salmond, Captain J. S. C., R.N. —B. 1882. Entered "Britannia," 1897, left 1898. Served in China in "Barfleur," landed in the Boxer operations, 1900. Mentioned in despatches. Qualified as torpedo lieutenant, 1905. Served in Wireless Telegraphy Experimental Department, "Vernon." 1908-11. Fleet Wireless Telegraphy Officer, Home Fleet (later Grand Fleet). 1912-15. Wireless Telegraphy Assistant to D.N.O. Admiralty, 1915-17. In command of " Odin," in Red Sea, 1917-19, mentioned in despatches for operations against Turkish forces in the Asir and Yemen. Served in Signal Division, Admiralty, on Wireless Telegraphy duties. Member of Radio Research Board. Commanding H.M.S. "Yarmouth," wireless telegraphy experimental ship. Saltzman, Charles McKinley, Major-General. Chief Signal Officer. —B. 1871, State of Iowa. Started business as railway telegraphist and graduated at West Point, 1896: As Cavalry officer took part in the. Spanish-American War, 1898. Transferred to the Signal Corps of the U.S. Army, 1901. Since identified with the electrical cable and radio work. U.S. Army. In charge of the radio work of the U.S. Army on the Panama Canal. Represented the United States at the International Radio-telegraphic Conference of London, 1912. Member of the Inter-Departmental Board which prepared regulations for the control of radio telegraphy in the U.S.A., 1912 to 1913. Appointed C.S.O. of the Army with rank of Major-General. Address: Washington, D.C.
Sankey, Captain M. P. H. Riall, C.B, C.B.E.. R.E. (Ret.) —B Nenagh, Ireland, 1853. Educ. Switzerland, Royal Military Academy, Woolwich, School of Military Engineering, Chatham. Served in England, at Gibraltar, and as Instructor in Fortification at the Royal Military Collage, Kingston, Canada. Posted to the British Ordnance Survey, and had charge of the Trigonometrical Division the Electrotyping Department and the Workshops. Retired from the service (1889) to join the Board of Messrs. Winans and Robinson, Ltd., and (1904) took up consulting work. Shorty afterwards joined the Boards of Marconi's Wireless Telegraph Company, Limited, and the Marconi International Marine Communication Company. Limited. Also a Director of several other companies. Served during war as Hon. Engineering Adviser to the Director of Fortifications and Works. Author of "The Energy Chart," "Practical Application to Reciprocating Steam Engines," Part IV of Rimington's Construction" (anonymously). Translated from German Prof. Ritter's book on Bridges and Roofs." Contributed numerous papers to I.C.E.,I.M.E., I.E.E., Inst. Naval Architects, Royal Society of Arts, Royal Society, etc., etc. Member of the following institutions: Civil Engineers, Mechanical Engineers (President 1920 and 1921), American Mechanical Engineers, Electrical Engineers, Royal Institution of Great Britain, Iron and Steel, Naval Architects, Junior Engineers, and Gas Engineers. Member of the Governing Board of the National Physical Laboratory and of the Wireless Telegraphy and Gaseous Explosives Committees of the British Association. Address: 57, Castle Bar Road, Ealing, W.5. Sarnoff, David. —B. in Russia 1891. Entered the United States 1900, and later became an American citizen. Employed as a messenger by the Commercial Cable Company, 1905. Entered the employ of the Marconi Wireless Telegraph Co. of America as office boy. 1906. Wireless operator at Siasconset Station, Nantucket Island, 1908. Manager, Marconi Station, Sea Gate, New York, 1909. Radio Inspector for Marconi Company and Instructor, Marconi Institute, 1912. Became Commercial Manager of the Marconi Company of America, 1917, and when that Company was absorbed by the Radio Corporation of America, was taken over as Commercial Manager of that concern, and became General Manager, 1921. Vice-President and General Manager, Radio Corporation, 1922. Member of the American Institute of Electrical Engineers; Fellow of the Institute of Radio Engineers; Member New York State Chamber of Commerce. and of the American Railway Association. Clubs: Railroad Club, Whitehall Club, Lotus Club. Address: 180, Pennsylvania Avenue, Chester Hill Park, Mount Vernon, New York. Schwill, Fr. —B. Strasburg (in Alsace), 1875. Started career as member of the German Post and Telegraph Service. Took part in the International Radiotelegraphic Conference at Berlin in 1906. Appointed by the Swiss Federal Government to the International Bureau of the Telegraphic Union to organise and supervise the new Radiotelegraphic section established by the Berlin Conference. Present position, Sub-Director of the International Bureau of the Telegraphic Union at Berne. Address: Bureau International de L'Union Telegraphique, Berne. Scott-Taggart, John. Educ. Bolton Grammar School, technical establishments and King's College, London. For four years was Departmental Manager and Research Engineer, Radio Communication Company, Ltd. Managing Director of Radio Press, Ltd., and Editor of Modern Wireless and of Wireless Weekly. Some time in charge of valve design and construction at Ediswan Lamp Works. Served 1914 to 1919: sometime Instructor of Wireless to 1st Army, but chiefly Wireless Officer to various units. Mentioned in despatches. Awarded Military Cross. Author of various papers before British Association and other societies, and numerous articles: also the volumes: "Thermionic Tubes in Radio Telegraphy and Telephony," "Elementary Text-book in Wireless Vacuum Tubes,"Wireless Valves Simply Explained," "Practical Wireless Valve Circuits," etc., etc. Fellow of the Institute of Physics and holds membership in the Physical Society and the British, American and French Institutions of Electrical Engineers. Address: Bush House, Aldwych, London, W.C.2. Shaughnessy, Edward, H., O.B.E.—B. 1871. Engineer-in-charge wireless section, Engineering Department, British Post Office. Entered Post Offrce Engineering Department, 1896, served in experimental, testing, telegraph and cable sections specialising on underground and submarine cables. Member of the Radio Research Board. Post Offiee representative on Committee of Wireless Section. Institution of Eleetrical Engineers. Vice-President, Radio Society of Great Britain, Examiner in Telegraphy for the City and Guilds of London Institute. Member of some committees and panels of the British Engineering Standards Association. Address: Engineering Department, General Post Office, London. Simpson, Lt.-Col. Adrian C.M.G. (late) R.E. —B. Edinburgh, 1880. Educ. Clifton and Sandhurst. Commissioned in His Majesty's Forces, 1900. Served in India, being transferred to the Regular Indian Army. Retired 1907. Becoming interested in wireless telegraphy, and started work with the English De Forest Wireless Telegraph Syndicate. His connection with Marcnni's Wireless Telegraph Company commenced with his joining the Field Station Department. On the formation of the Russian Company of Wireless Telegraphs and Telephones, 1908, appointed managing director of that company. During the war served in Russia: and at the War Office. Late Director of Wireless Telegraphy under the Government of India. Deputy Managing Director of Marconi's Wireless Telegraph Co., Ltd., and The Marconi International Marine Communication Co., Ltd., Chevalier of Order of St. Anne, 3rd Degree, and of Order of St. Stanislaus. Addresses: Marconi House, Strand, W.C.2., The Naval and Military Club, and Ranelagh. Sinclair, Duncan, —B in London, 1896, Educ., Aske's Hatchham and King's College, University of London, and abroad. Entered Royal Flying Corps 1915 as wireless officer, and served in France 1916-18, and in Russia, 1919. Instructor at R.A.F. Electrical and Wireless School, 1918. Mentioned in despatches and awarded Order of St. Stanislaus. Appointed to Signals Branch. Air Ministry, 1920, and now in charge of Civil Aviation Signalling under Group Captain Blandy, C.B., D.S.O., the head of the Branch. Appointed to Controllerate of Communications, Air Ministry, 1920. To date has been actively engaged upon air route signals organisation, and commercial aeroplane, seaplane, flying boat and airship wireless. Author of papers on "Signalling on our Airways," "Airship Wireless in 1921," "The Applications of Wireless to Commercial Flying," "The Wireless Stations of the British Air Routes," etc. Member of American Institute of Radio Engineers, and Radio Society of Great Britain Address, Air Ministry. Slee, Commander J. A,. C.B.E., R.N. (Ret.) —B. 1878, Wimbledon. Educ. on training ship "Britannia." Passed for his lieutenant's Commission, and after service on the "Decoy," "Ernest," "Anson," and "Severn," qualified as Torpedo Lieutenant, and spent a year on the staff of the "Defiance" at Devonport, where he gained his first wireless experience, 1901. Whilst attached to "Queen," 1906, eyesight trouble developed and he was obliged to transfer to shore service. For two years after quitting the sea he served as one of the Wireless Telegraph Experimental Officers on the "Vernon" at Portsmouth, and from 1908 until 1919 was in charge of all shore wireless and war signal stations in Great Britain. Promoted Acting Commander, 1913. Acting Captain, 1918. On the formation of the Wireless Board was appointed its chief. Awarded C.B.E., 1919. Retired from the Navy December, 1919, with the rank of Commander. Joined the Marconi International Marine Communication Co. as Technical Superintendent and Adviser, January 1st, 1920. Appointed Technical Manager, M.I.M.C. Co., Ltd., June, 1921. Address: 7, Elvaston Place, London. Smith, Tom Vincent, Major, M.C. —B 1872, in London. Joined the Amalgamated Radio Telegraph Company in 1906. Director of the British Radio Telegraph Company. Consulting engineer until outbreak of war. Served on the Civil Aerial Transport Committee, and the Wireless Committee of the Institution of Electrical Engineers. Past Pres. of the National Association of Supervising Electricians. Papers before the Royal Artillery Institution at Woolwich, and the British Association. During the war was in charge of R.F.C. wireless on the Western Front, and later Officer-in-Charge of Wireless at the Air Ministry for all theatres of war. Decorations: Military Cross, Knight of the Military Order of Savoy, 1914-15 Star. Twice mentioned in despatches. Address: 60, Knightsbridge, S.W.1. Smith-Rose. Reginald Leslie, Ph.D., M.Sc. —B. 1891. Educ. Imperial College of Science and Technology. Practical experience with Messrs. Siemens Bros., Woolwich, from 1915-19, engaged on experimental work in connection with military, manual and automatic telephones: and latterly with therrnionic valve amplifiers for telephone lines and wireless receiving sets. Now Assistant-in-Charge of the Wireless Division of the National Physical Laboratory, engaged on general Radio Research Member of Committee "C" on Directional Wireless of the Radio Research Board of the Department of Scientific and Industrial Research. Physicist-in-Charge of Directional Wireless Research under Committee "C" of the Radio Research Board. Fellow of Physical Society of London. Member of Council of the Radio Society of Great Britain. Member of Wireless Sectional Committee of the Institution of Electrical Engineers. Author of several scientific paper and articles. Address: National Physical Laboratory, Teddington. Snell, Sir John Francis Cleverton, Kt. (Cr.1914.) —B. Saltash, Cornwall, 1869. Educ. Plymouth Grammar School. and King's College. London. 1883, With Messrs. Woodhouse & Rawson, and with Messrs. Cromptcn Co., at the Kensington Court and Notting Hill Power Stations, and at Stockholm (Sweden), 1892. Resident Engineer at King's Road Station, St. Pancras, 1896, Borough Electrical and Tramways Engineer, Sunderland, 1906, in private practice as a Consulting Engineer, 1910, became partner of Messrs: Preece, Canlew. Such and Rider, Consulting Engineers, 1919. Relinquished partnership and accepted position of Electrical Adviser to the Board of Trade and Chief Electricity Commissioner-designate. 1920. appointed Chairman of the Electricity Commission. Member of the Nitrogen Products Committee (Ministry of Munitions), and Chairman of the Power Sub-Committee. Member of the Electrical Trades Committee (Board of Trade). Member of the Electrical Power Supply Committee (Board of Trade). Member of the Advisory Council for Scientific and Industrial Research. Member of the Imperial Wireless Telegraphy Committee. Member of the Electrification of Railways Advisory Committee. Past Pres. I.E.E. Member of council I.C.E. Fellow I.E.E. (Amer.). Contributed: "Distribution of Electrical Energy," 1906 (Spon); "Power House Design," Second Edition, 1921 (Longmans); and many papers read before several Engineering Institutions. Addresses: "Southernway," by St. Martha's, Guildford, Electricity Commission, Gwydyr House, Whitehall, S.W.,The Athemeum. St. Stephens and Royal Fowey Yacht Clubs. Squier, Major-General Sir George Owen K.C.M.G., Ph.D. —Educ. Johns Hopkins University, Baltimore. Grad. Doctor of Physics 1893. Research student under the late Professor Rowland and in the laboratory of the late Sir William Preece at the British General Post Office. Discovered the use of living trees as a means of receiving wireless messages 1904. and published a paper entitled "The Absorption of Electro-Magnetic Waves by Living Vegetable Organisms." Author of numerous papers on the subject of wireless telegraphy and has devoted special attention to the use of wireless telegraphy in military operations. In 1896 the City of Philadelphia awarded him the John Scott Legacy Medal and premium for the polarising photo-chronograph. Awarded the Elliot Cresson Gold Medal for his researches in multiplex telephony, 1912. Member of National Academy of Sciences, 1919. Awarded the Franklin Medal, 1919. Awarded the Distinguished Service Medal, United States Army, 1919. In 1919 decorated with the insignia of the Order of Knight Commander of St. Michael and St. George. In 1922 awarded the Italian decoration, Commander of Order of the Crown. In 1922 awarded Cross of a Commander of the French Legion of Honour. In 1923 appointed Honorary Knight Commander of the Most Distinguished Order of St. Michael and St. George. Chief Signal Officer U.S. Army. Formerly Military Attache to the American Embassy in London. Representative at the Conference of Interallied Radio Technical Committee, at Paris, 1921. Appointed an ex-officio member representing War Department of the United States National Committee, International Electrotechnical Commission. Address: War Department, Washington, D.C., U.S.A.
Swinburne, James, F.R.S. —Educ. Clifton College, 1870-74; apprenticed engineering works, 1874-9. Employed by Messrs. J. W. Swan & Co. (1881) to organise their lamp factory in Paris. Consulting Engineer since 1894. Author of many papers before Scientific and Technical Societies, and in Technical Press. Member of the Technical Committees considering the Imperial Wireless Scheme, 1912 and 1919-20. Member of various scientific societies. President of the Institution of Electrical Engineers, 1902-3. Addresses: 82, Victoria Street, S.W.1; Woodhurst, Oxted, Surrey. Swinton. Alan A. Campbell, F.R.S. —B. Scotland, 1863. Opened career in 1882 at the Armstrong Works, Elswick. Consulting electrical engineer in London since 1887, having been responsible for the carrying out of many large electrical installations. Chairman of Crompton & Co., Ltd., and director of several electricity supply and engineering manufacturing companies. Associated with the development of the Parsons turbine and other important inventions. A vice-President of the Royal Society of Arts; a vice-President of the Institution of Electrical Engineers; Chairman of the British Scientific Instruments Research Association; a Member of the Executive Committee of the Board of the National Physical Laboratory; a member of the Broadcasting Board; Past President of the Rontgen Society; a Manager of the R. Institution of Great Britain (1912-15). Member of Sub-committee "B" on Atmospherics of Radio Research Board of the Department of Scientific and Industrial Research. Past President of the Radio Society of Great Britain. Has devoted considerable attention to scientific research, including wireless telegraphy. M.Inst.C.E., M.I.E.E, M.I.Mech.E. Clubs. Athenaeum, Carlton, etc. Addresses: 66, Victoria Street, Westminster, S.W.1; 10 Chester Square, S.W.1. Thornblad, Thor. —B. Upsala, Sweden, 1885 His interest in the theory and practice of wireless dates from 1899. Author of the first Swedish standard work on wireless telegraphy, "Traadloes Telegrafi" (932 pages), published by P. A. Norstedt & Soeners Foerlag, Stockholm, 1911. Passed examination as student at the High School of Stockholm, 1904. Entered the Royal Engineers as cadet, 1904. Commissioned 1906. Studied mathematics, physics and chemistry, 1906-10, first at The Royal Technological Academy of Stockholm, later at the University of Stockholm, By command of the Swedish Government. studied wireless telegraphy in foreign countries. Author of a number of articles on radio-telegraphy in the scientific and daily press. Member of the Royal Military Association of Stockholm, the Society of Friends of the Swedish National Museum; the Roynl Swedish Yacht Club, etc. Knight of the Order of the Crown of Italy. Address: Strandvagen 7. Stockholm. Todd, David Wooster, Captain U.S. Navy. —B. Round Valley, California, 1874. Educ. private and public schools in Mich., Nev., and San Francisco. Appointed to Naval Academy, 1891, graduated 1895. Served at sea on various vessels of the United States Navy, and in command of the "Pittsburgh" flagship in European waters; has served ashore as instructor in ordnance, Naval Academy; in charge of Radio Division of Bureau of Steam Engineering, Navy Department, and as Assistant Superintendent of the Radio Service, Attended International Radiotelegraphic Conference, London, 1912, as a delegate. Director Naval Communications, 1916. Attended Inter-Allied Radio Conference in Paris upon United States entry into European War, and subsw4uently organised the American end of the Inter-Allied Transatlantic Radio System. Now in command of the U.S.S. "Nevada,' U.S. Battle Fleet. Travailleur, Maurice. —B. Brussels, 1871. Graduated as engineer at Brussels University, 1893. Appointed Electrical Engineer to the late King of the Belgians, 1897. One of the founders or the Marconi International Marine Communication Co., Ltd., and the Societe Anonyme Internationale de Telegraphie sans Fil. Managing Director of the Societe Anonyme Internationale de Telegraphie sans Fil, and Chairman of the Agency Telegraphique Belge, both in Brussels. Tsiang Tseng-yi. —B. in 1877. Native of the Haining District of the Chekiang Province. Acquired the third degree of Literature at the Metropolitan Examination in Peking, 1904, and appointed Junior Clerk of the Board of Revenues. Soon afterwards transferred to the Board of Communications (then known as Yuchuanpu). Proposed that all the commercially and provincially owned telegraph lines be nationalised and completed this work under his personal supervision and placed them under the direct control of the Yuchuanpu, which was the beginning of the unification of the Chinese Telegraph system. In 1911, as Commissioner of Telegraphs of the Yuchuanpu, he caused several powerful radio stations to be established, iu Peking, Nankin and other places. He served over ten years in the telegraph service, holding the following positions: 1910-11, Commissioner of Telegraphs of the Yuchuanpu; 1913-16, Chief of the Financial Department of Telegraphs, Posts and Navigation; 1917 to date (1925), Councillor and Chief of the Telegraph Department and Director-General of Telegraphs of the Ministry of Communications, and Chairman of the Chinese Society of Electrical Science. Permanent Address: 22 Ch'ia Hutung, Peking, (South City), China. Turner, Laurence Beddome, M.A., M.I.E.E. —B. 1880. Educ. Bedford Grammar School and King's College, Cambridge (1904). First class honours in Mechanical Sciences Tripos in 1907. Spent 1907-8 in research work at the C.U. Engineering Laboratory. After a year in the workshops and drawing office of Messrs. Siemens Bros. at Woolwich and Siemens u. Halske A.G. at Berlin, entered in 1910 the Engineer-in-Chief's office of the G.P.O. Engaged there in W/T experimental and design work. Attached to the Army Signals Experimental Establishment at Woolwich 1916. Fellow (1919) and Assistant Tutor of King's College, Cambridge. Member of the Imperial Wireless Telegraphy Committee, 1919; and of the Wireless Telegraphy Commission, 1920 ----. Author of "Outline of Wireless," 1921, and numerous technical papers. Address: King's College, Cambridge. Vallauri, Giancarlo. —B. Rome, 1882. Entered the Royal Naval Academy. Appointed officer of the Royal Italian Navy, 1903. After a few years at sea quitted the active naval service and joined the Polytechnic School in Naples, obtaining the diploma of engineer and the electrotechnic diploma, 1907. Since conducted electrical tuition in the Polytechnic Schools of Padua, Karlsruhe and Naples. Connected with many industrial electric establishments. Inaugurated at the Polytechnic School in Naples a course in Wireless Telegraphy, 1912, and supervised that subject till the end of 1916. Became Director of the Institute of Electricity and Wireless Telegraphy of the Royal Navy, 1918. Is now also Professor of Electrotechnics at the University of Pisa and engaged in supervising the new station of Coltanocentre. His attention has mainly been turned to the study of ferro-magnetic phenomena. to which he has made important contributions. Has published a series of papers on Ionic Valves, and on radiation measurements. Address: R. Accademia Navale, Leghorn, Italy. Van der Bijl, Dr. H. J. —B. Pretoria, 1887. Educ, Victoria College, South Africa and Universities of Halle and Leipsic, where he gained his doctorate. Visited the United States in 1913, and joined the Engineering Department of the American Telephone and Telegraph Co., and Western Electric Co. Scientific and Technical Adviser to the Government of the Union of South Africa, 1920-23. Appointed Chairman of Electricity Supply Commission oi the Union of South Africa, 1923. M.I.R.E., M.I.E.E. (Amer.). Among his inventions is the modulation system used successfully by the American Telephone and Telegraph Company in 1911 for wireless telephone communication over a distance of 5,000 miles. Figured prominently in the development of the Thermionic Vacuum Tube. Author of "The Thermionic Vacuum Tube and its Applications," and numerous publications in scientific and technical journals. Address: P.O. Box 1091, Johannesburg, Union of South Africa. Van der Pol, Balth, Jun., D.Sc. —B. 1889, at Utrecht. Educ. at Utrecht, graduating as Doctorandus (1916). His interest in the theory and practice of wireless dates from 1904. Came to England in 1916 to study under Professor J. A. Fleming. Proceeded to Cambridge in 1917, working under Professor Sir J. J. Thomson. at the Cavendish Laboratory for about eighteen months. Author of a number of monographs upon physical and radiotelegraphic subjects. Appointed Conservator and placed in charge of the physical research laboratory of Teyler's Institute, Haarlem (Holland). He is one of the founders of the Dutch Radio Institute, of which society he is vice-president. In 1922 was appointed as physicist in the research laboratory of Philips Glowlamp Works (Eindhoven), where he is now in charge of the wireless research. Address: 4, Jan Smitz-laan, Eindhoven, Holland. Vanni, Dr. Giuseppe. —B. at Albano Laziale (Rome), in 1862. Graduated in science 1887. Proceeded to Strassburg University, 1890, where he studied electrical measurements under Prof. F. Kohlrausch. In 1894 he was appointed lecturer of Physics at the Col1egio Romano, and in 1912 was elected professor and technical director at the Military Radiotelegraphic Institute in Rome. In 1912, took part in the International Conference of London, as a member of the Italian delegation, and also in the two Conferences of the Hour, held in Paris in 1912 and 1913. His work has been principally concerned with optics, electrical engineering and wireless telegraphy. He made, in 1912, interesting experiments in wireless telephony between Rome and Treviso (420 Km. ), and between Rome and Tripoli (1,000 Km. ), thus obtaining, at the time, the record for wireless transmission. Is at present Director of the Military Radiotelegraphic Institute, and editor of the "Bo1lettino Radiotelografico del R. Esercito (Radiotelegraphic Army Bulletin), which aims at extending wireless research among the officers of the Italian Army. Address: Rome (49), Military Radiotelegraphic Institute, Viale Mazzini 10. Vyvyan, R. N. -Educ. Charterhouse. Elect. and Eng. training, Faraday House, 1896-1900. Assistant Engineer Whitehaven, Burton-on Trent, Portsmouth and Hammersmith. Joined Marconi's Wireless Telegraph Co., 1900. Built Poldhu Wireless Station, subsequently proceeding to Canada as Managing Engineer until 1908. Built Spanish-American chain of stations. Appointed, in 1910, Superintending Engineer of Marconi's Wireless Telegraph Co. Responsible for design and construction of most of the high power stations erected by the Marconi Co. Joined R.F.C. 1916, served in France. Later sent to America as member of the British War Mission. Demobilised and returned to Marconi Co. early in 1919 in charge of design construction and management of all wireless stations owned or erected by that company, April 1923. Appointed Engineer-in-Chief of Marconi Co. Address: Windmill Hill House, Hampstead, and Marconi House, Strand, W.C.2. Weagant, Roy A. —B. Morrisburg, Ontario, Canada, 1881. Educ. Stanstead College, Stanstead, Quebec, and McGill University, Montreal. Graduated from Electrical Engineering Course, 1905. Studied Physics under Sir Ernest Rutherford and became interested in wireless. Gained engineering experience with the Montreal Light, Heat, and Power Company, the Westinghouse Electric Manufacturing Company of Pittsburg, Pa., and the De Laval Steam Turbine Company. Took up commercial wireless work in 1908. Entered service of the Marconi Wireless Telegraph Company of America, 1912, where he soon rose to the position of Chief Engineer. Appointed, 1920, Consulting Engineer, Radio Corporation of America. Member American Institute Electrical Engineers, Fellow of the Institute of Radio Engineers and former member of its Board of Directors and Standardisation Committee. Inventor of a novel method of eliminating static interference. Address: Douglas Manor, Long Island, New York. Whiddington, Richard, M.A., D.Sc., F.Inst.P. —B. 1885, in London. Educ. at St. John's College, Cambridge, where after taking degree in 1908, he undertook research work under Professor Sir J. J. Thomson. Elected Fellow of St. John's College, 1911. In 1914, went to Royal Aircraft Factory, Farnborough, to design wireless apparatus for the Flying Corps. During the war designed a number of the standard R.A.F. wireless sets and assisted on the W/T Board and Inter-Allied W/T Commission in Paris. Demobilised with rank of major, June, 1919. Has published a number of original papers on various electrical subjects. Member of Sub-Committee "D" on Thermionic Valves, of Radio Research Board, of the Department of Scientific and Industrial Research. Professor of Physics, University of Leeds. Address: Leeds University; and 36, Mow Road, Headingley, Leeds. Wibier, Albert, Lieut.-Col. d'Etat Major. —B. Renaix, 1876. Sent, in 1911, by the King of the Belgians, to install the wireless network in the Belgian Congo. Became Director-General of that service, and for the construction of new wireless services. Organised and controlled the wireless service of the Belgian Army during the late war. President of the Wireless Commission ref the Belgian Aero Club, Member of the Conaite National Beige de l'Union Internationale de Radiotelegraphic Scientitique. Address: 11, Rue de la Reinette, Brussels, Belgium. Wilson, Brig.-Gen. Sir Samuel Herbert, K.C.M.G., K.B.E. C.B., C.M.G. —B. 1873. Educ. privately and at R.M. Academy. Entered Army, R.E., 1893. Served S. Africa, 1899-1900. Served great war. 1914-18. Governor and Commander-in-Chief Trinidad and Tobago, 1921. From 1918 to 1921 Principal Assistant Secretary, Committee of Imperial Defence and Head of Imperial External and Defence Branch Cabinet Secretariat. Secretary Imperial Communications Committee; Wireless Telegraphy Committee; Officier Legion d'Honneur; French Croix de Guerre; Commandeur de la Couronne, Belgium; Belgian Croix de Guerre. Address: Government House, Trinidad, and Heath Cottage, Puttenham, Surrey. Wilson, Ernest. —B. Educ. the Yorkshire College Leeds. Whitworth Scholarship. Apprenticed to Greenwood & Batley, and Siemens Bros. Professor of Electrical Engineering at King's College. Dean of the Faculty of Engineering, King's College. M.I.C.E., M.I.E.E., M. Wireless Soc., London. Fellow of King's College. Contributed various papers read before Royal Society, I.E.E., Royal Society of Arts, etc. Holder of Kelvin Prize of the I.E.E. (1921). Addresses: University of London, King's College, W.C.2., and Savile Club. Wilson, William Hamilton. —B. 1878. Educ. Collegiate School, Wanganui, New Zealand. Apprenticed to Cable & Co.. Marine Engineers, Wellington, N.Z. Electrical and mechanical courses at King's College, Strand, London, 1901 to 1904. Assistant Engineer Metropolitan Electrical Supply Co., Ltd.. London, 1904. to 1906. Chief Assistant Electrical Engineer and Acting Electrical Engineer to East Indian Railway Co., Bengal, India, 1906 to 1908. Electrical Engineer to John Birch & Co. Ltd., London, 1910 to 1911. Secretary and Director of the Wilson Apparatus Co., Ltd., Carlisle 1911 to 1913. In private practice since 1913 as electrical engineer and inventor. Inventor of various wireless telegraph aparatus, X-ray apparatus, and thermoelectric instruments. Designed some of the earliest transformers and apparatus used for army aircraft wireless, etc., before 1912, and transformers, wireless telegraph condensers and transmitting sets used in large numbers during the war. M.I.E,E., M. Rontgen Soc. Joint author of various papers in "The Electrician" on "Measurement of Self Induction, High Tension Discharge Apparatus," etc. Author of paper before Royal Society on "Ruhmkorft Coils." Address: 5-6 Bank Broadway. Kingston Hill, Surrey. Yokoyama, Eitaro. —B. 1883. Graduated Engineering College of the Tokyo Imperial University, 1908. Entered Ministry of Communications, Japan. Engaged in radio researches at the Electro-technical Laboratory of the Ministry. One of the inventors of T.Y.K. Oscillation Gaps for Radiotelephony. Proceeded to America and Europe to study, 1916. Returned to Japan, 1918, and resumed service at the same Laboratory. Promoted to the Head of the Radio Section of the Laboratory, 1920. M.I.R.E. (America), I.E.E. (Japan). Inst. of Japanese Telephone and Telegraph Engineers. Private Address: Kiharayama 162, Omori, Tokyo. Zenneck, Professor. Dr. J. —B. 1871, in Wurttemberg. Studied at Tubingen, Obtained his doctorate, 1894. Studied natural history in London and elsewhere. Subsequently devoted himself entirely to physics. Assistant in the Physical Institute in Strassburg, 1895-99, Engaged in making tests with wireless telegraphy in the North Sea, 1899-1900. Assistant Professor of Physics in the Institute of Technology, Dantzic, 1905. Professor of Physics at the Institute of Technology, Brunswick, 1906. Professor of Physics at the Institute of Technology, Dantzic, 1911, Munich, 1913. During part of the war Technical Adviser to the Atlantic Communication Co., which then operated Sayville wireless station. Member of the Bavarian Academy of Sciences. Fellow of the Institute of Radio Engineers. Address: Technische Hochschule, Munchen (Germany). AMONG those whom death has claimed since the last edition of the YEAR BOOK went to press, are five whose names were closely associated with the development of wireless. 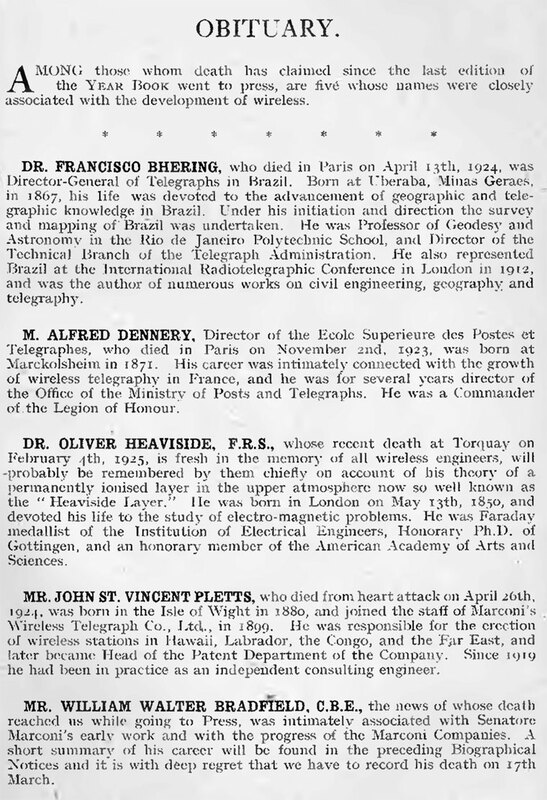 DR. FRANCISCO BHERING, who died in Paris on April 13th, 1924, was Director-General of Telegraphs in Brazil. Born at Uberaba, Minas Geraes, in 1867, his life was devoted to the advancement of geographic and telegraphic knowledge in Brazil. Under his initiation and direction the survey and mapping of Brazil was undertaken. He was Professor of Geodesy and Astronomy in the Rio de Janeiro Polytechnic School, and Director of the Technical Branch of the Telegraph Administration. He also represented Brazil at the International Radiotelegraphic Conference in London in 1912, and was the author of numerous works on civil engineering, geography and telegraphy. M. ALFRED DENNERY, Director of the Ecole Superieure des Postes et Telegraph., who died in Paris on November 2nd 1923, was born at Marckolsheim in 1871. His career was intimately connected with the growth of wireless telegraphy in France, and he was for several years director of the Office of the Ministry of Posts and Telegraphs. He was a Commander of the Legion of Honour. DR. OLIVER HEAVISIDE, F.R.S., whose recent death at Torquay on February 4th, 1925, is fresh in the memory of all wireless engineers, will probably be remembered by them chiefly on account of his theory of a permanently ionised layer in the upper atmosphere now so well known as the "Heaviside Layer." He was born in London on May 13th, 1850, and devoted his life to the study of electro-magnetic problems. He was Faraday medallist of the Institution of Electrical Engineers, Honorary Ph.D. of Gottingen, and an honorary member of the American Academy of Arts and Sciences. MR. JOHN ST. VINCENT PLETTS, who died from heart attack on April 26th, 1924, was born in the Isle of Wight in 1880, and joined the staff of Marconi's Wireless Telegraph Co., Ltd., in 1899. He was responsible for the erection of wireless stations in Hawaii, Labrador, the Congo, and the Far East, and later became Head of the Patent Department of the Company. Since 1919 he had been in practice as an independent consulting engineer. MR. WILLIAM WALTER BRADFIELD, C.B.E., the news of whose death reached us while going to Press, was intimately associated with Senatore Marconi's early work and with the progress of the Marconi Companies. A short summary of his career will be found in the preceding Biographical Notices and it is with deep regret that we have to record his death on 17th March. The Year-Book of Wireless Telegraphy and Telephony 1925. (1925). London: Iliffe & Sons, Ltd. pp. 869-889. This page was last edited on 6 January 2017, at 15:43.